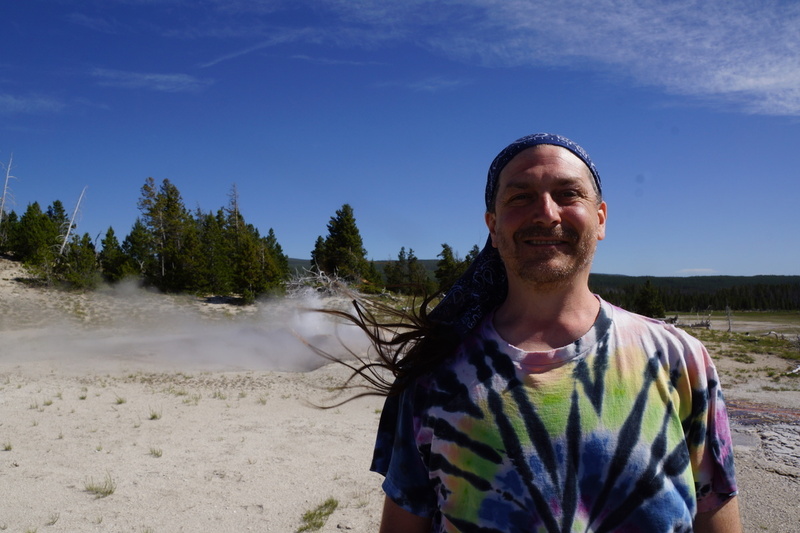 Our first stop this year was Yellowstone national park, with our friend Random. 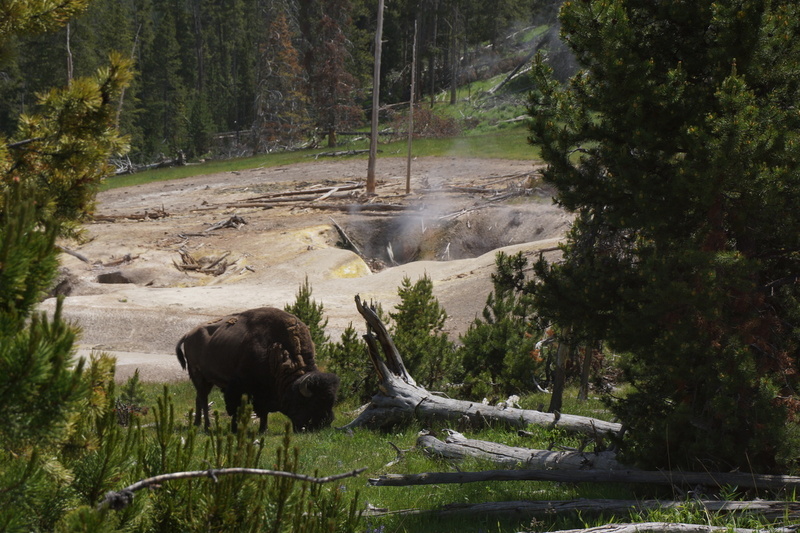 This is a typical view at Yellowstone. We'd often ask each other, See anything over there? 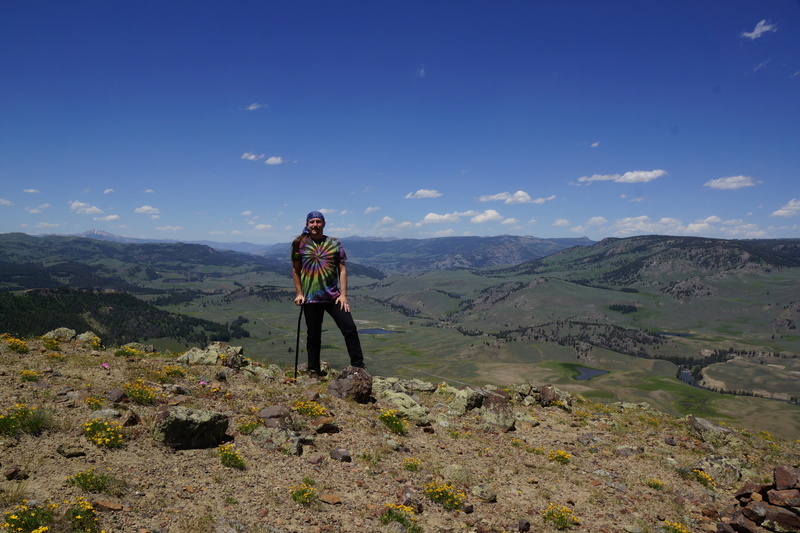 with the answer Other than stunning scenery and a few bison, no. 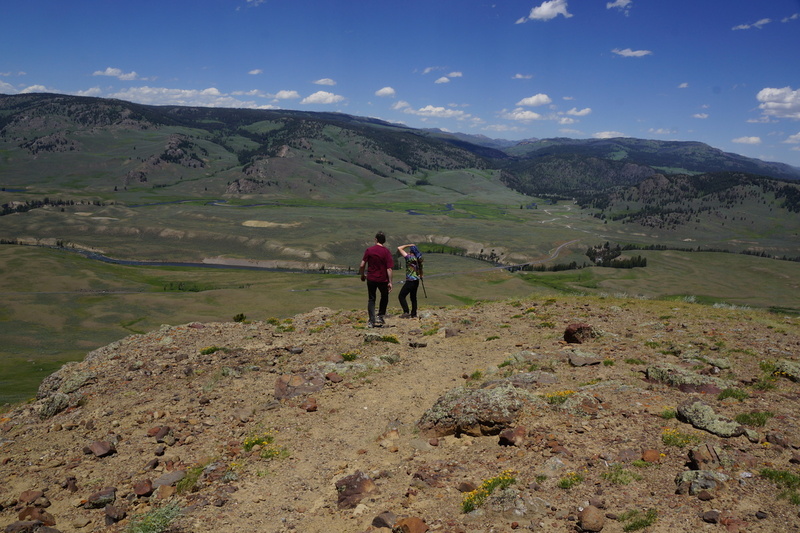 About 1/3 of Yellowstone is the caldera of an ancient, active volcano. 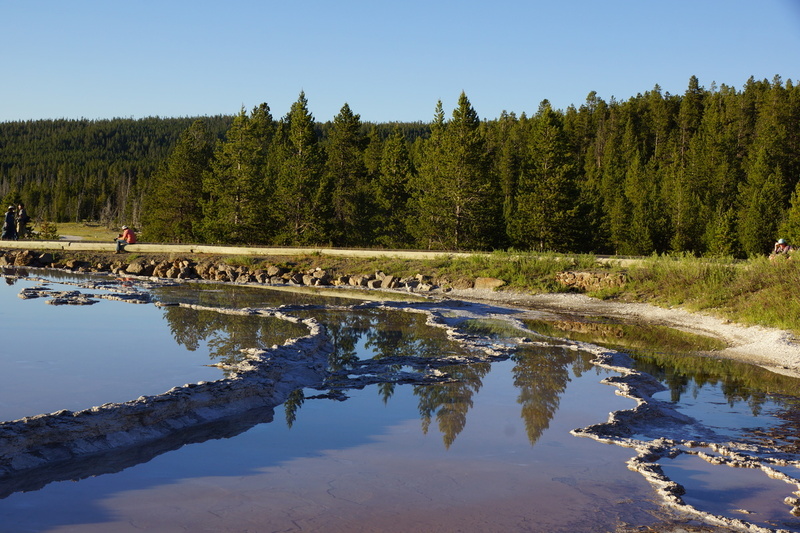 It is ancient in that it last erupted about 600,000 years ago, but it is active in that the hot magma is still below the surface and powers Yellowstone's unique geothermal features, such as geysers, hot springs, and acid pools. 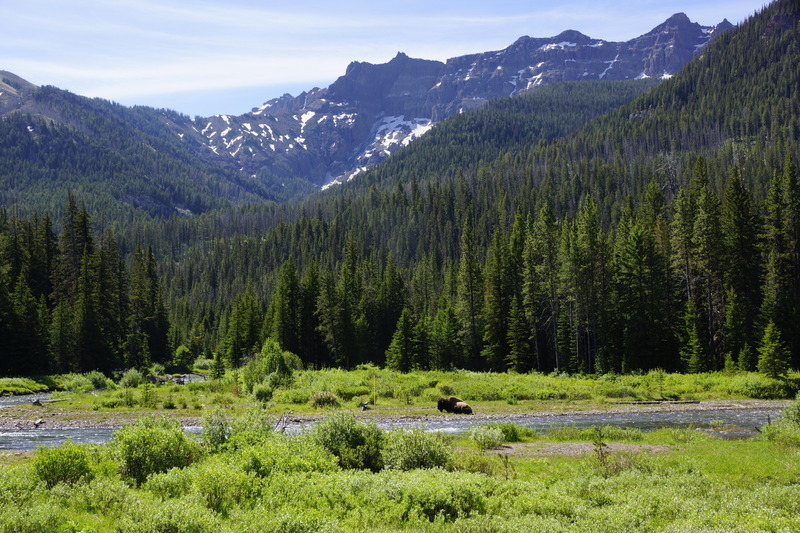 The other thing which makes Yellowstone amazing is that it has been a national park for over 120 years, which means it also has a good population of bear, bison, elk, and other wildlife, including the recently-reintroduced wolves. 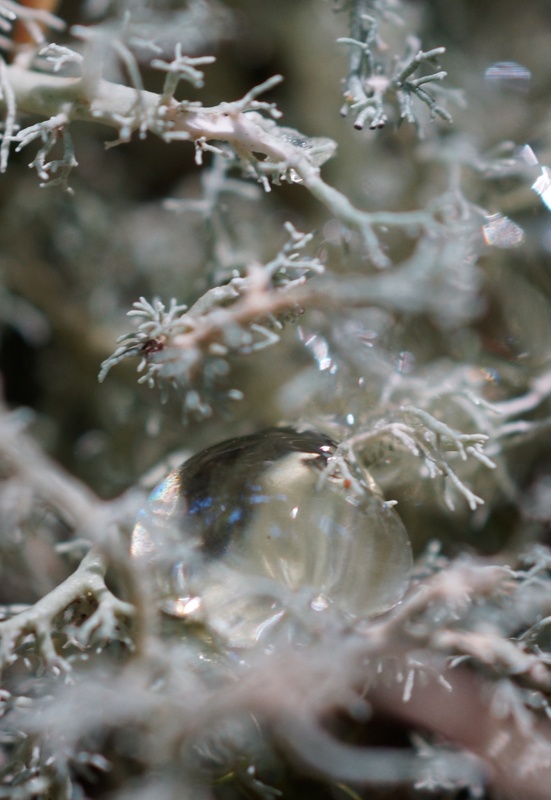 It's the kind of place where you come across something and think, Wow, I've never seen anything like this before, and a few moments later come across something else and think, Wow, I've never seen anything like this before, either, and this keeps happening all day. 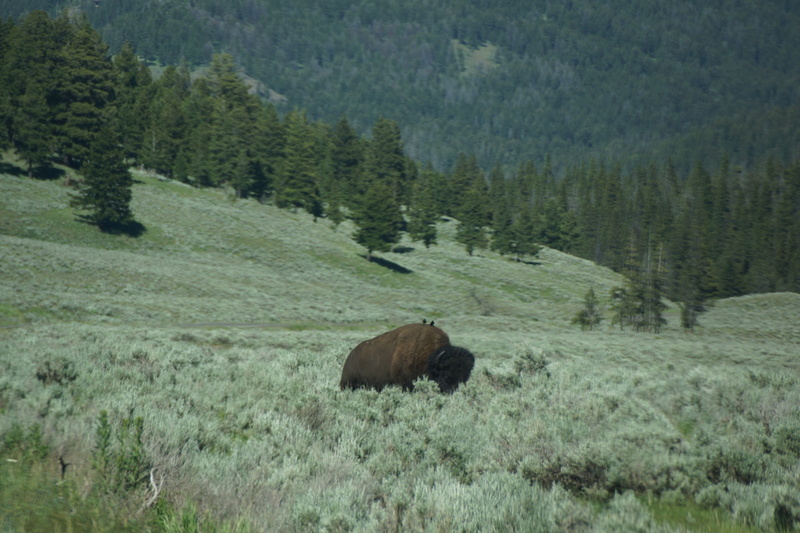 Yellowstone is home to about 4900 bison. 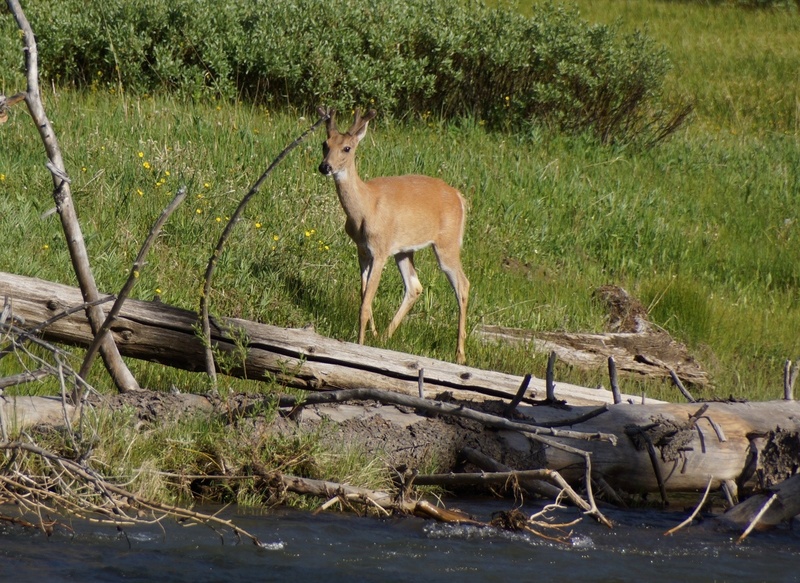 The Lamar Valley, which happened to be along the road by our cabin, is home to many of them. 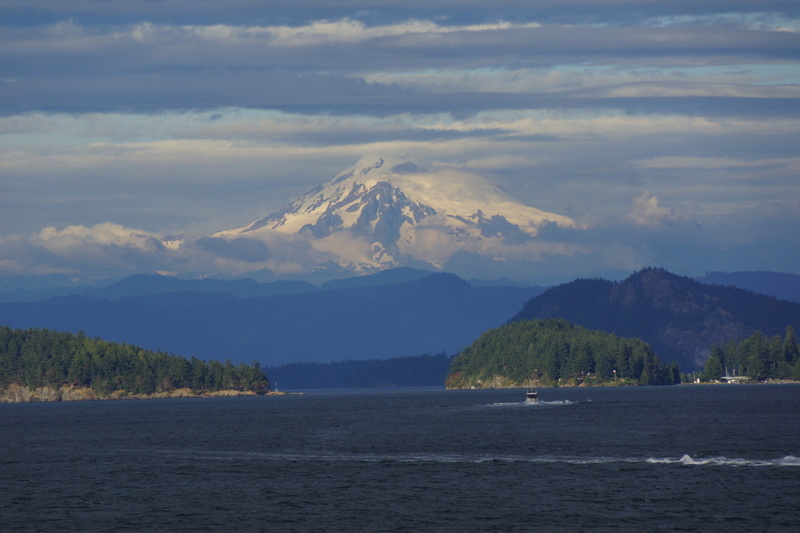 This view repeated itself for many miles along the river. 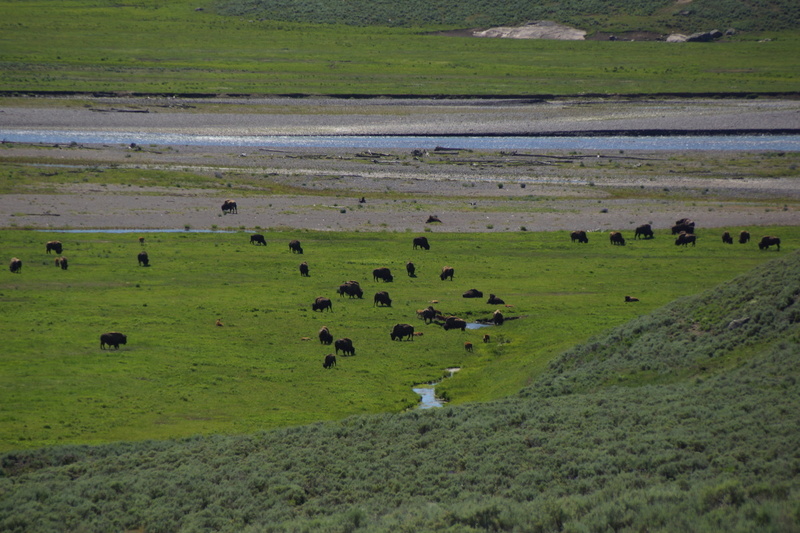 And, around dusk, the herd would move up from the river to the road. 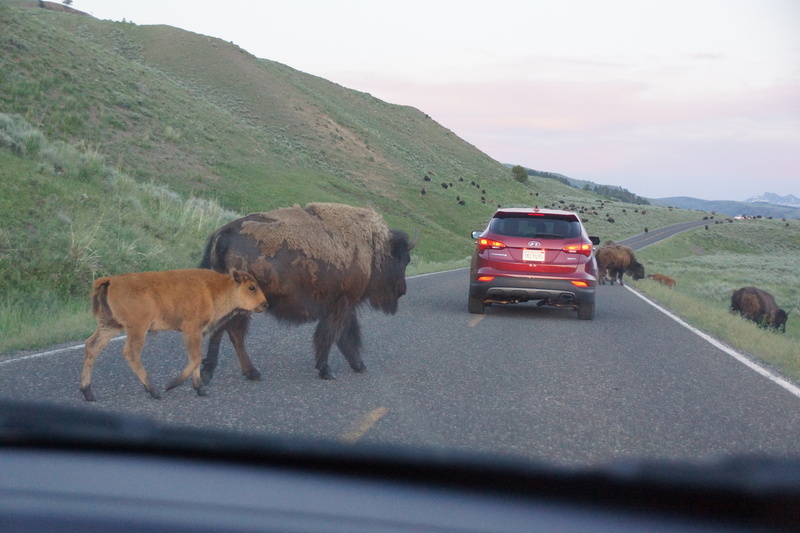 The bison seemed to accept the cars as part of the herd, and would often walk alongside the cars that were going slow... and since every now and then one would cross the road, going slow was a necessity. The closest one got about 2 feet (2/3 of a meter) from the car. Random thought this one looked cold and needed to warm up in the car. 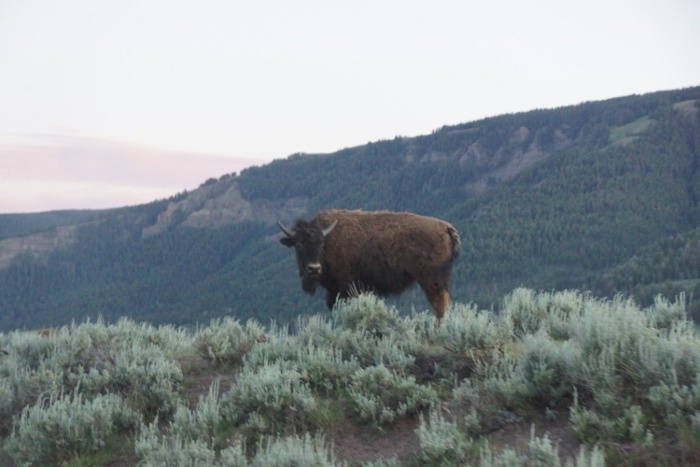 Several of the bison carried a few birds on their back - most likely oxpeckers, who live symbiotically with the bison by eating ticks and other parasites. Bison were far from the only wildlife in Yellowstone, though. 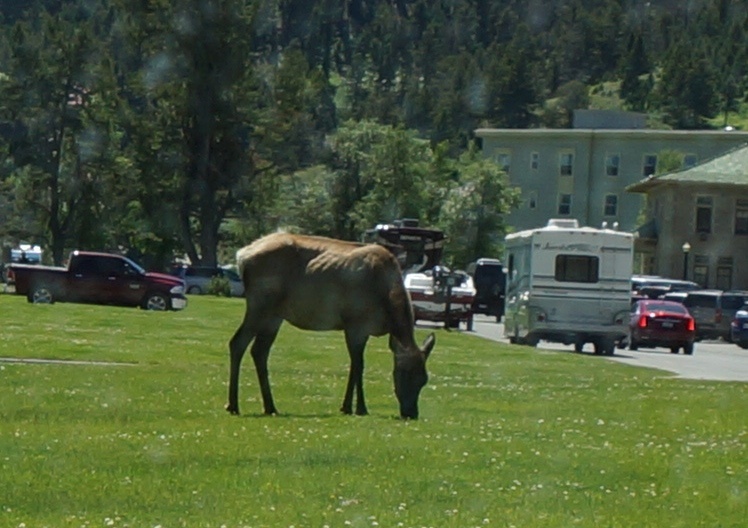 This lady - I think a female moose - was grazing in the roundabout by the visitor's center. 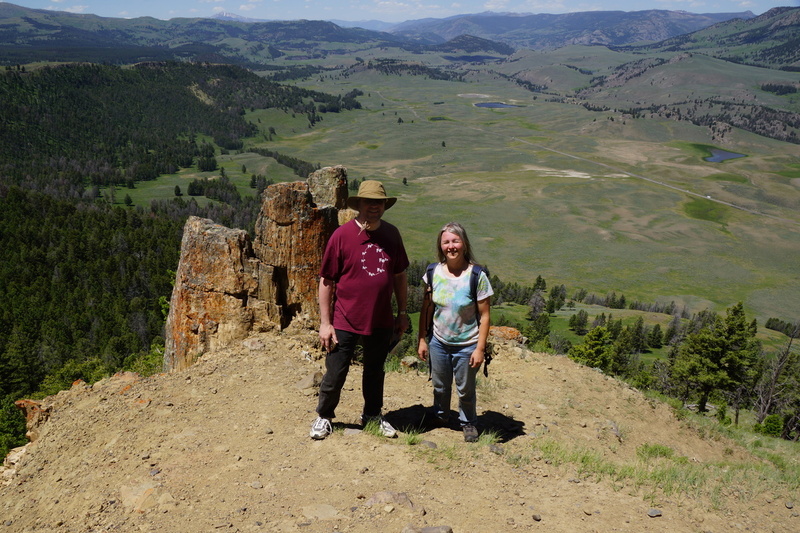 This part of the Yellowstone River valley is called Calcite Springs. 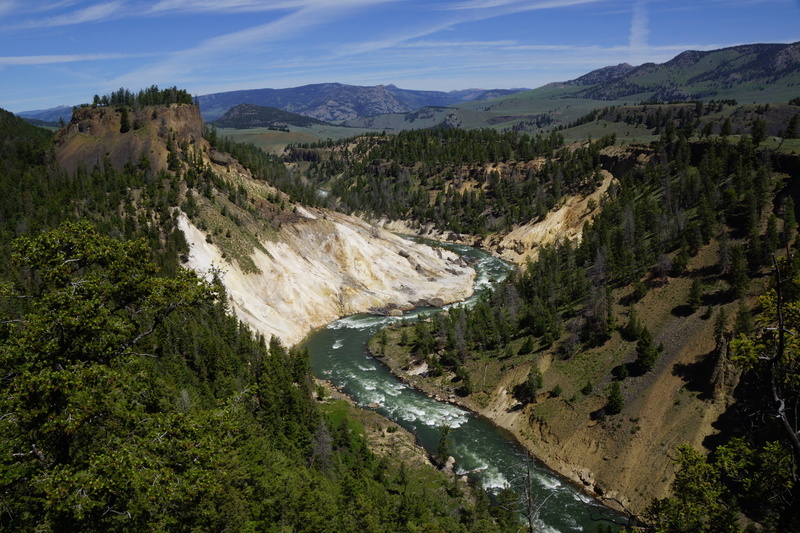 The Yellowstone river has been cutting through the crumbling rock of the valley since the last ice age. 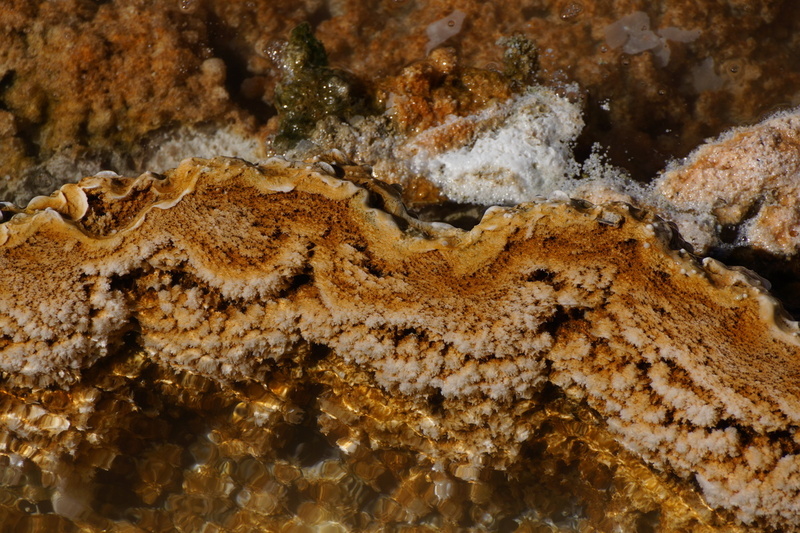 The Calcite Springs bubble hot oil and sulfur from deep below the surface. 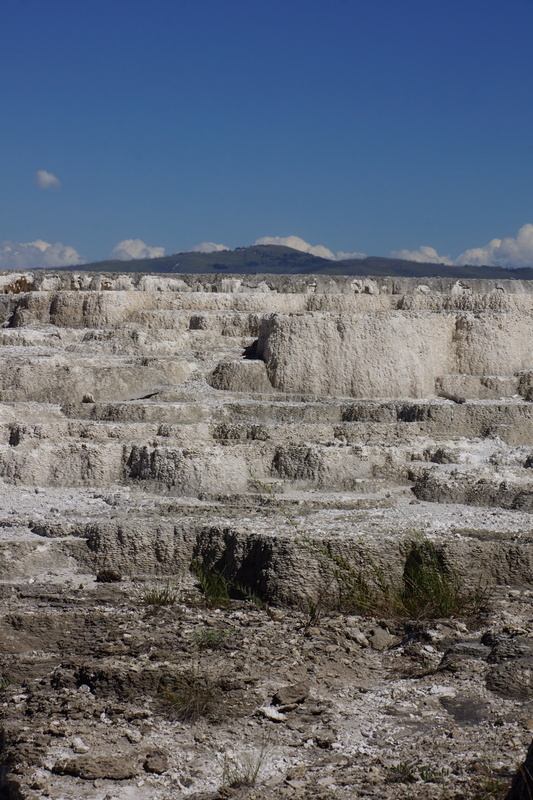 Puffs of smoke are visible over the sheet of white calcite. The gray streak just left of center in this photo is a column of smoke. 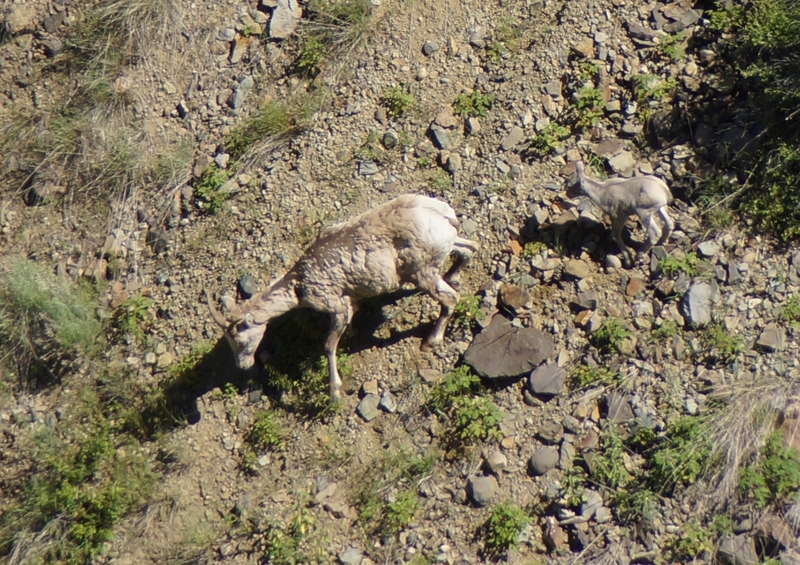 Far below, a mother bighorn leads her baby to the river for a drink. Not far down the road, we had to pause for a bull elk crossing. And then we caught sight of a bit of buff-colored fur above the grass - this guy had found a groundhog snack. I think this is a big coyote, but it could be a young wolf that hasn't quite grown into its ears. Not all the wildlife we saw was exotic. 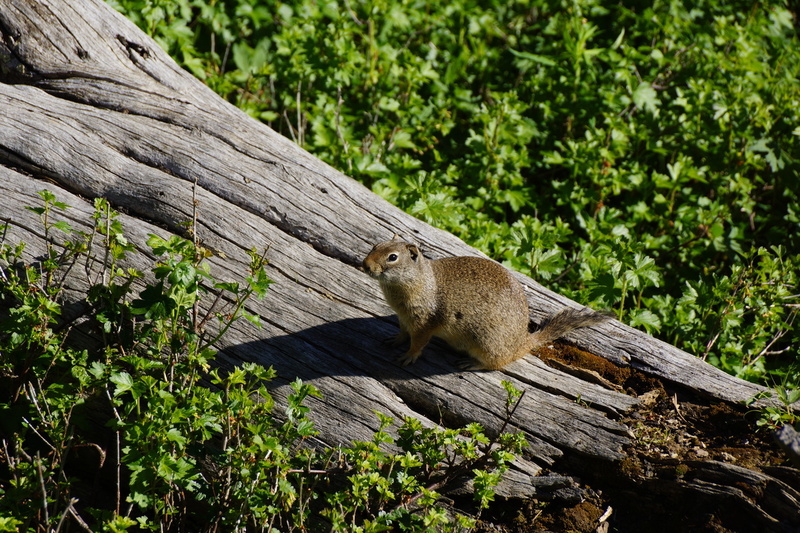 There were plenty of groundhogs and gophers. There were also no shortage of blacktail deer. 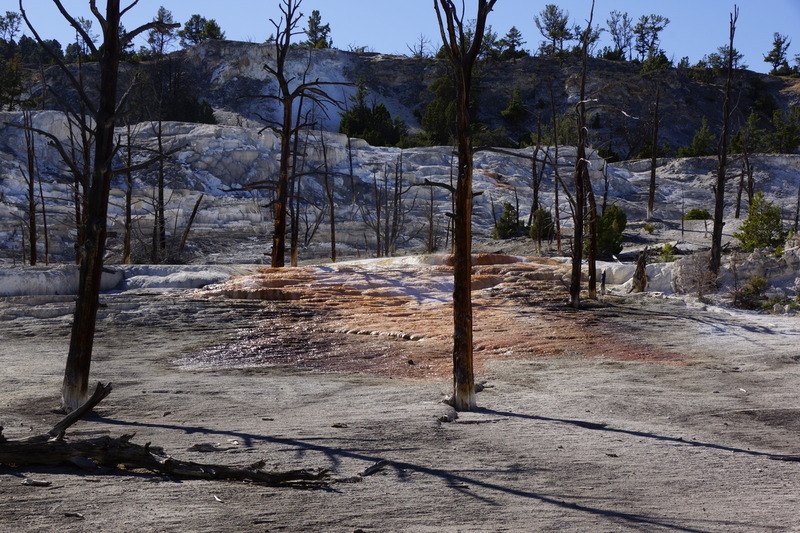 But also things like this - a pit of boiling sulfuric acid. Anything that falls into this pool will probably boil to death, then dissolve. 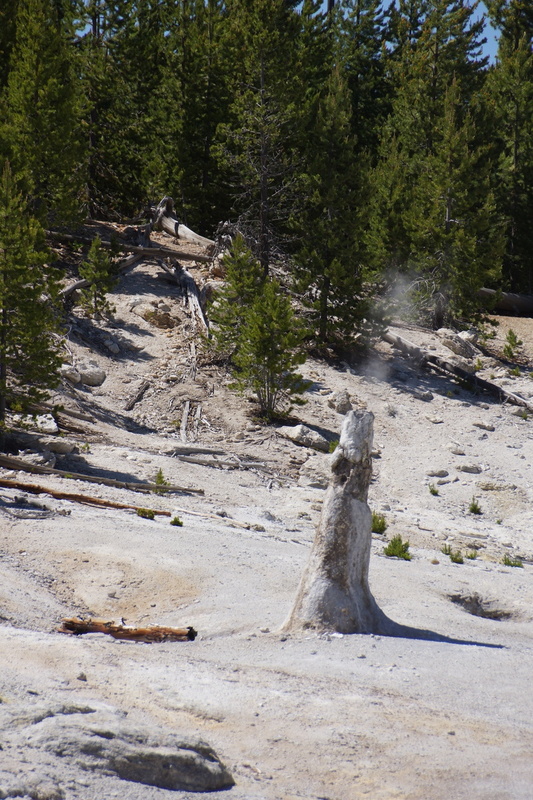 It is not surprising, then, that things in Yellowstone tend to have names like The Dragon's Mouth . 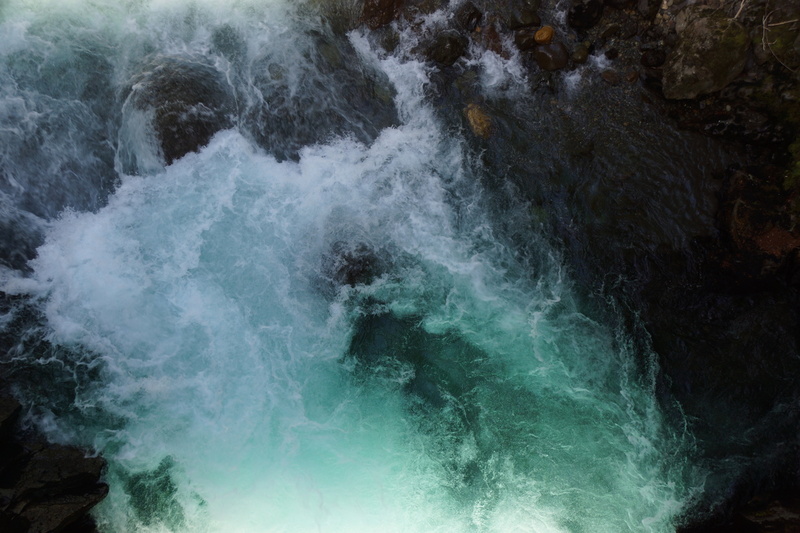 The origin of the name is not documented, but I would guess it's the sound of the water - a rushing hiss punctuated by roars as a wave of water rushes out. The park's residents seem unperturbed by this strange and hostile environment. Note the smoking fumerole in the background. This one seems to be intentionally hanging out in the sulfurous steam bubbling out of this cauldron. Bison are not friendly. Bison are dangerous. They also sometimes hang around right on the walkways. We waited for this one to move a bit further away from the boardwalk, and then I snapped a quick picture as Eric walked quietly by. Yellowstone had an extra surprise for us this day: a cloud rainbow! The sun shining through ice crystals high in the atmosphere create a shifting rainbow, which looks entirely and indescribably alien, even in the alien landscape of Yellowstone. 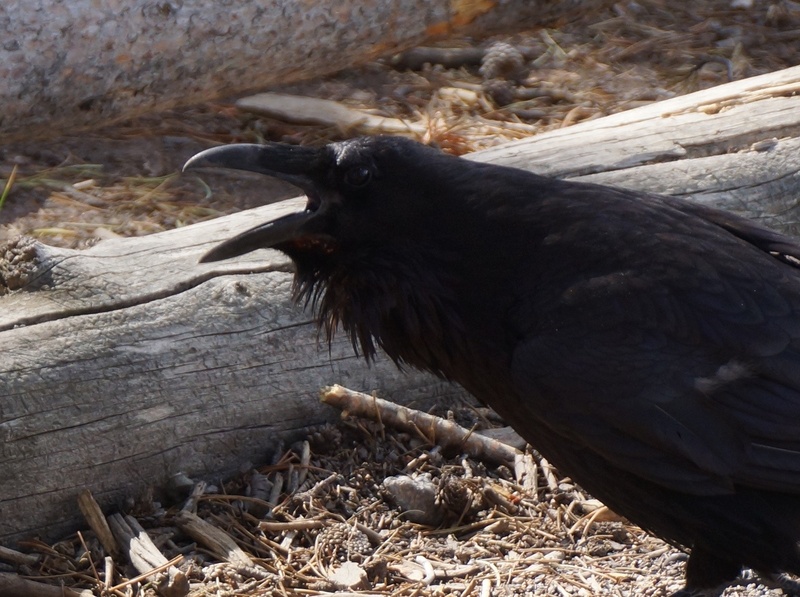 Raven makes his opinion known to the crowd. On the way back, a crowd of stopped cars ( wildlife jam ) signalled that there was something to see. We parked at the next turnout and walked back to see this guy, placidly eating dandilions down the hill. My bear taxonomy is not very good - I'm not sure if it's a cinnamon black bear or a grizzly - but it was quite big. Much nearer by, a black bear emerged from the tall grass. It was close enough for Eric to snap a quick bear selfie. 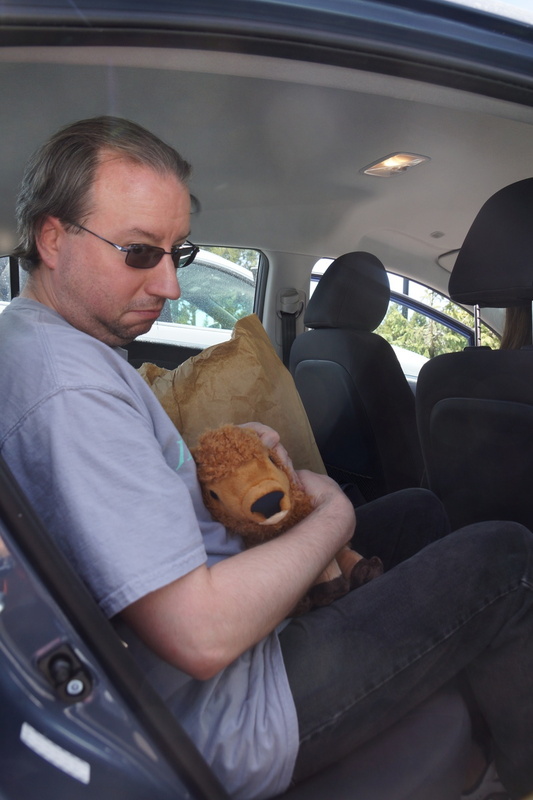 I realize the bear doesn't look all that close, but believe me, this is about as close as you want it to be. Eventually it wandered close enough that we quietly made our way back to the car, and left the rest of the crowd to its fate. Pronghorn grazing along the roadside in the Lamar Valley. And, of course, more bison. The first stop the next day was the Artist's Paint Pots. 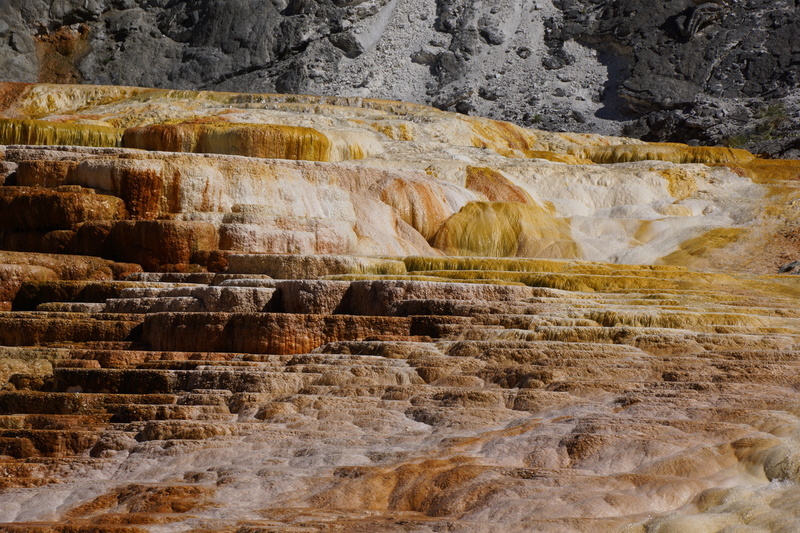 The paint pots are boiling pools of mud, colored white by calcium. There is something strangely disconcerting about watching the groud boil and hearing it blurp and spurk as it spits globs of white, plaster-like mud at passerby. 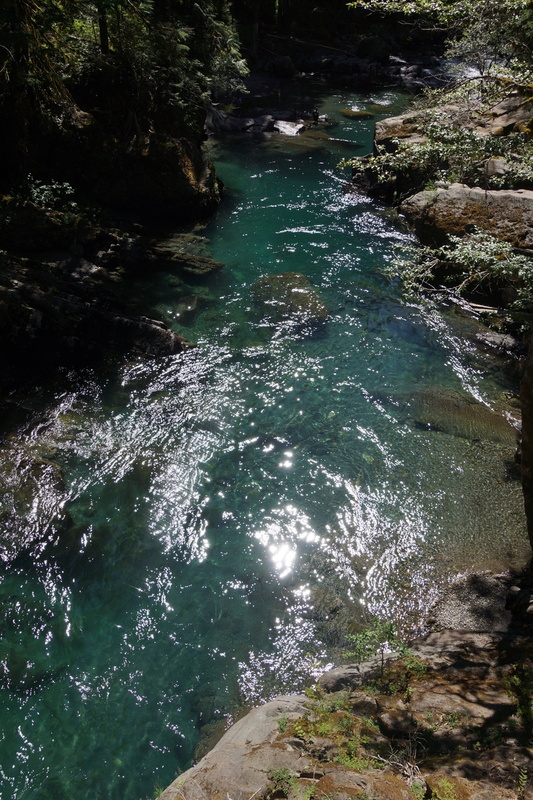 There are also brightly-colored pools - the water a cloudy blue-white, the edges a mix of yellow and red. 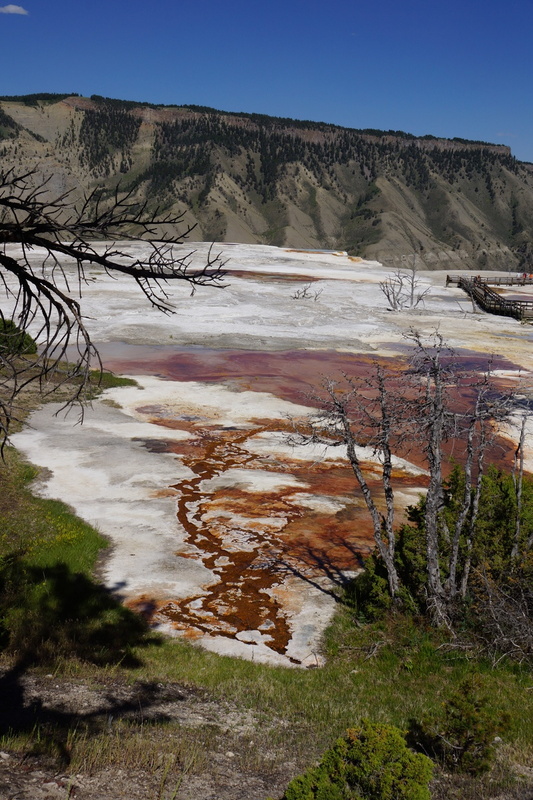 The red color is caused by bacterial mats. 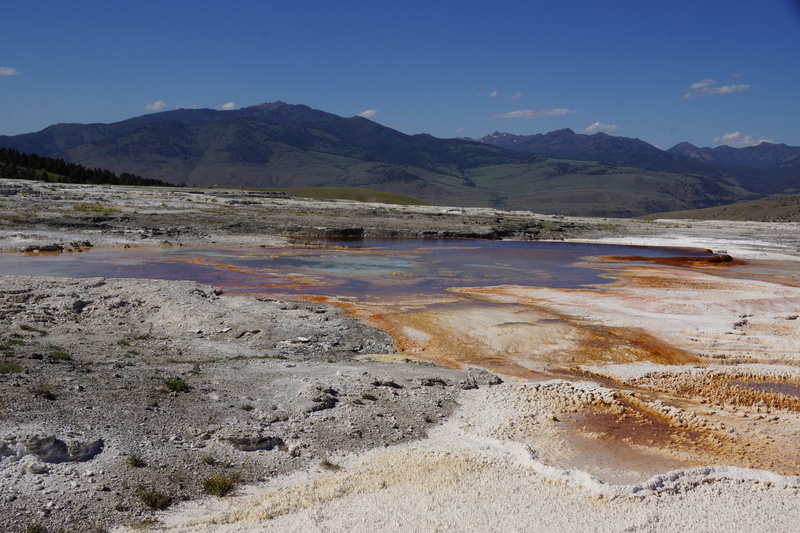 The bacteria are specially adapted to the acid and heat of Yellowstone, and thrive in all but the hottest parts of the boiling pools. The braches of dead trees, bleached like bones, confess the harshness of this environment. 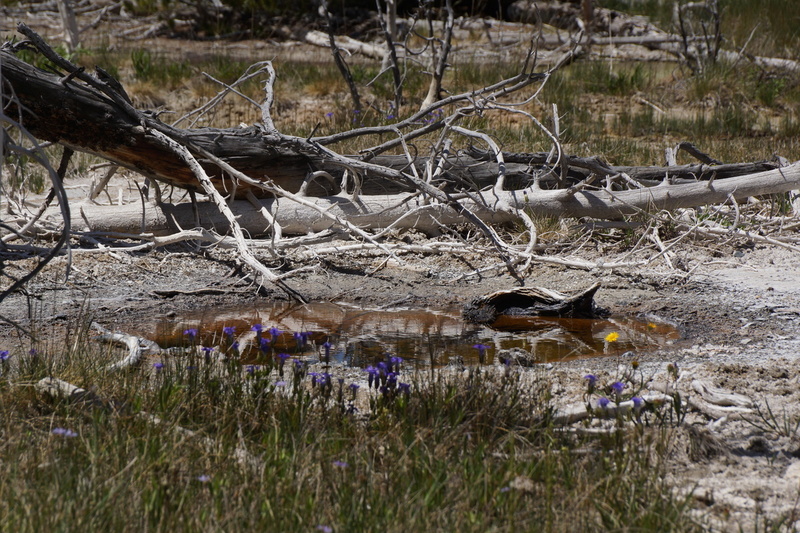 Nonethless, wildflowers creep up to the edges of these hostile pools. 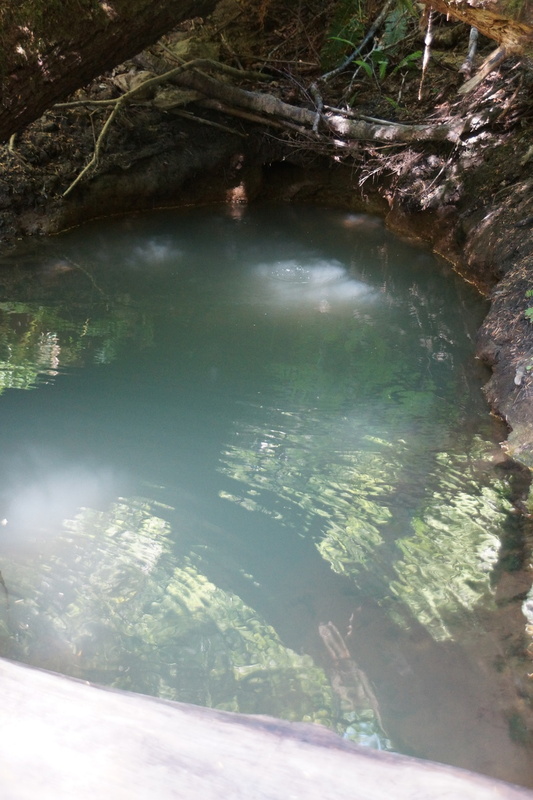 Beryl Spring is one of the hottest springs, so the water is clear. We walked up just as Fountain and Morning Geyser were erupting. They kept up this show the whole time we were there - about half an hour. 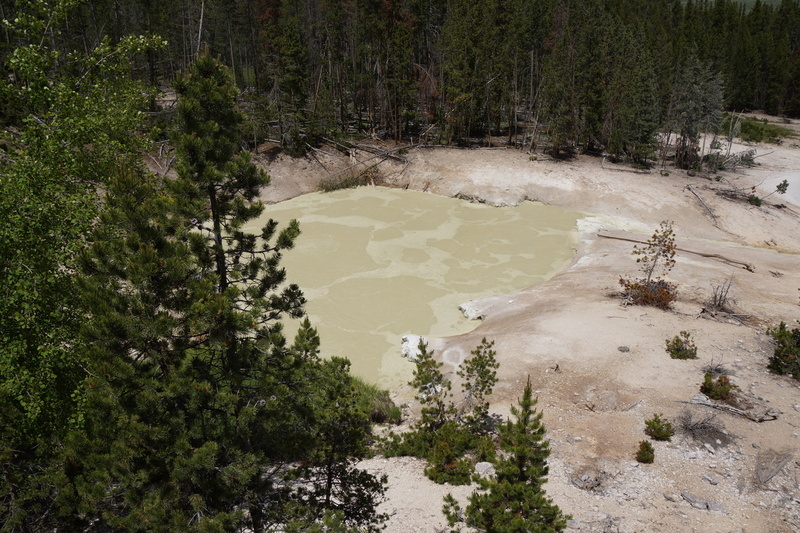 The much-smaller Morning Geyser has lovely pastel pools. 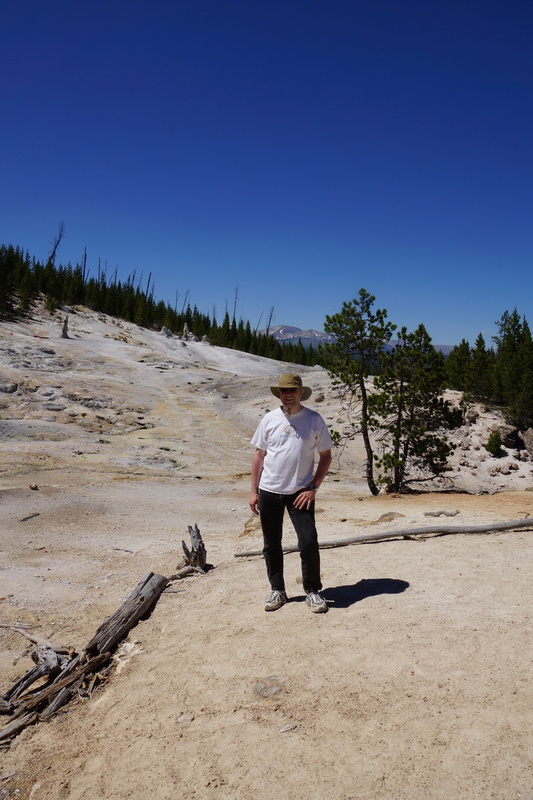 Eric in front of a third erupting geyser in the area, the Twig Geyser. 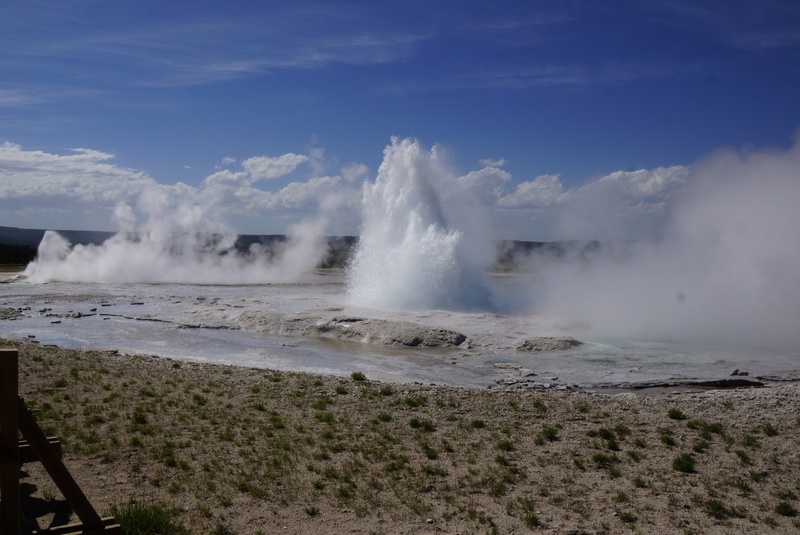 Just up the boardwalk, the Red Spouter fumerole roars like an angry dragon. 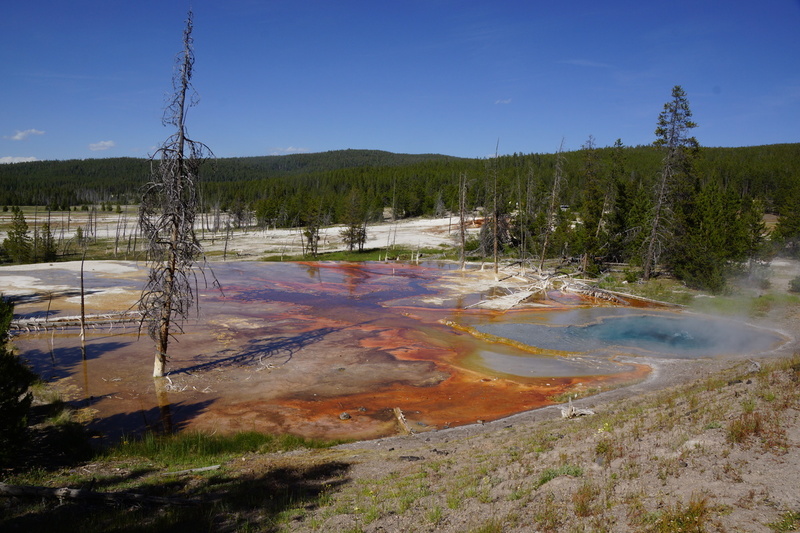 The Leather Pool, opposite the Red Spouter fumerole. 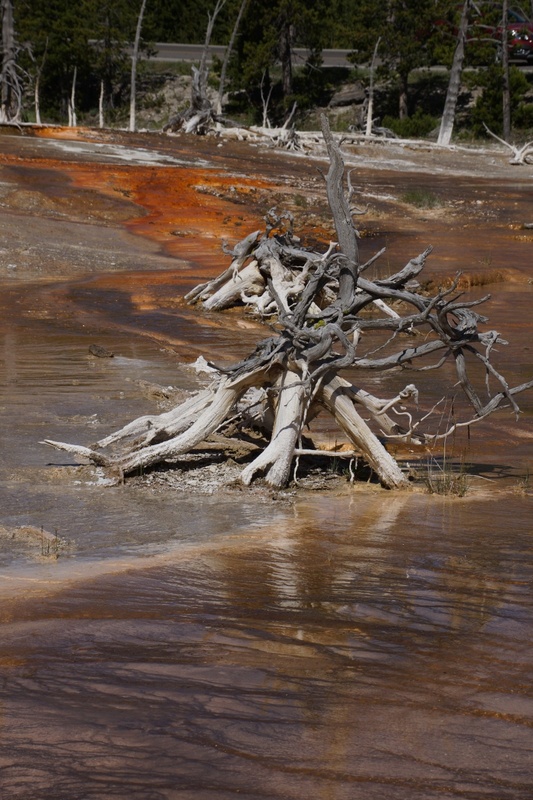 The Celestine Pool - an otherworldly rainbow on the bleached landscape. Its acid waters form eerie sculptures of white, red and gray. 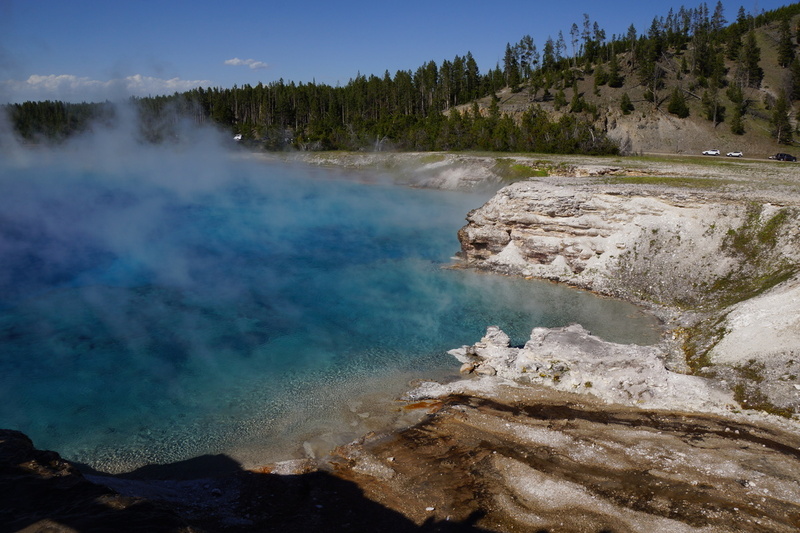 The clear blue of the Excelsior Geyser Crater means it is too hostile even for the red bacterial mats to survive. 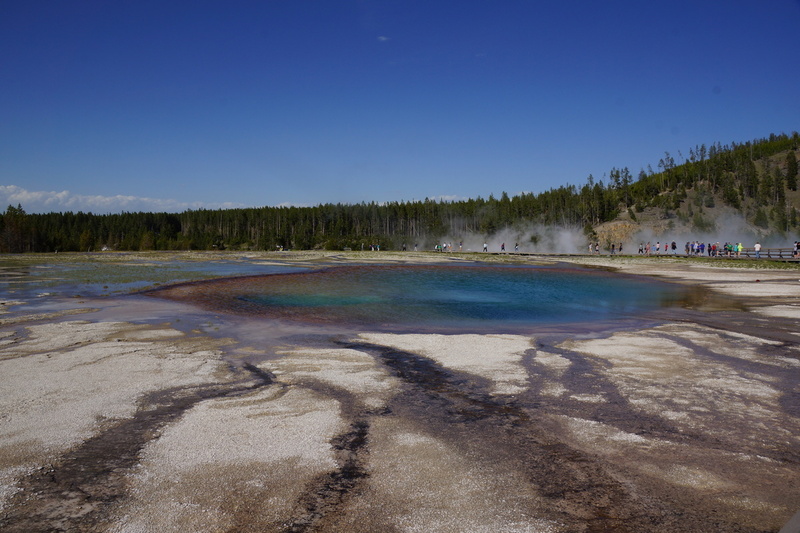 Today's destination: The Grand Prismatic Spring. 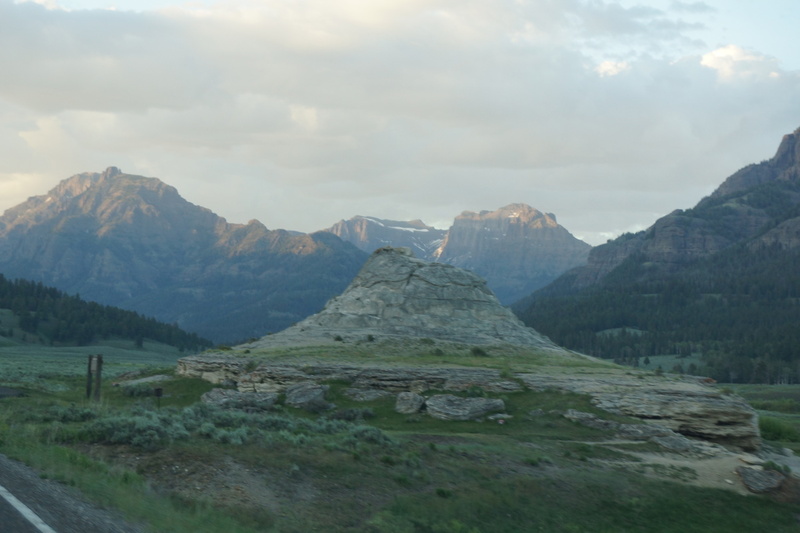 This is an otherworldly location even among the strange environs of Yellowstone. The wind blows a hot mist over the rainbow pool, like a portal to another dimension. It's also a fine location for a tourist photo. The ride home brought another wildlife jam at the bear-spotting point, so we stopped to see what had everyone's attention. This time it was a couple of baby bears waiting for Mom by a tree. Other onlookers assured us that mom was in the forest beyond the babies, not somewhere behind us. 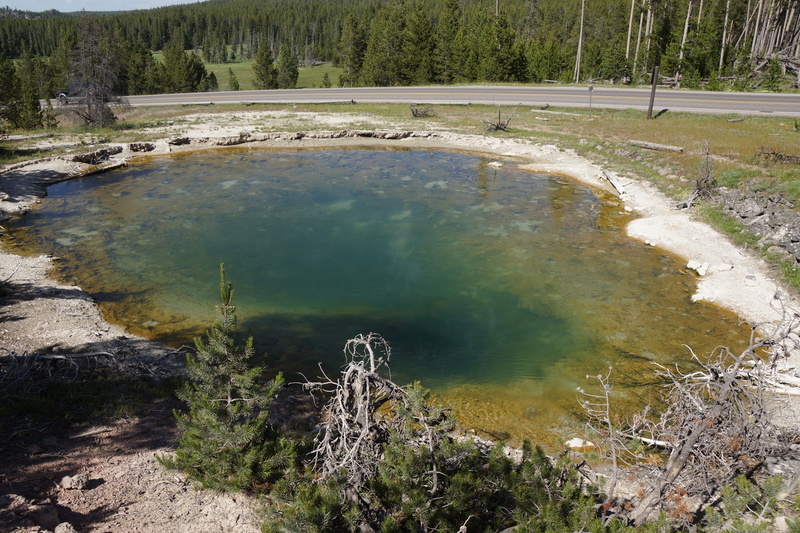 Soda Spring is an old park feature that now only occasionally burbles out some calcium-laden water and a puff of sulfurous fumes. By day three we'd hit all the major features, so we dedided to see some of the park's lesser-known sights. 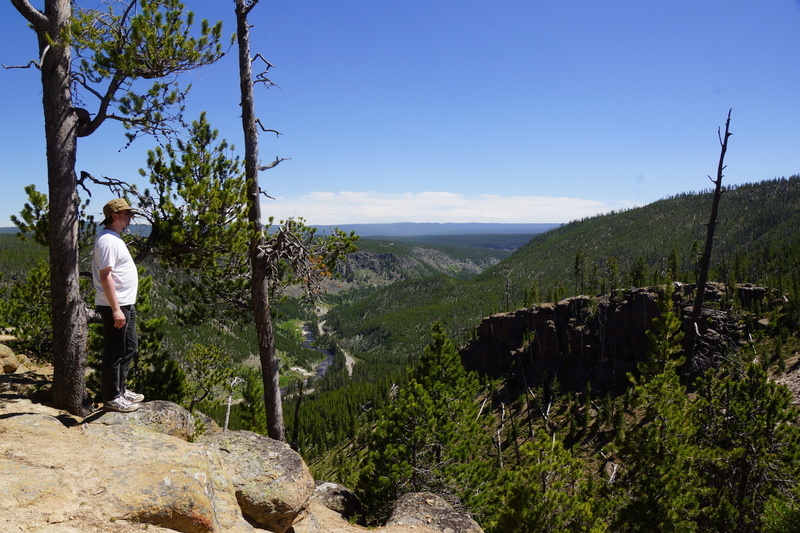 The first stop was the Monument Geyser Basin, overlooking the Gibbon River canyon. The traditional photo of Eric on something precarious. 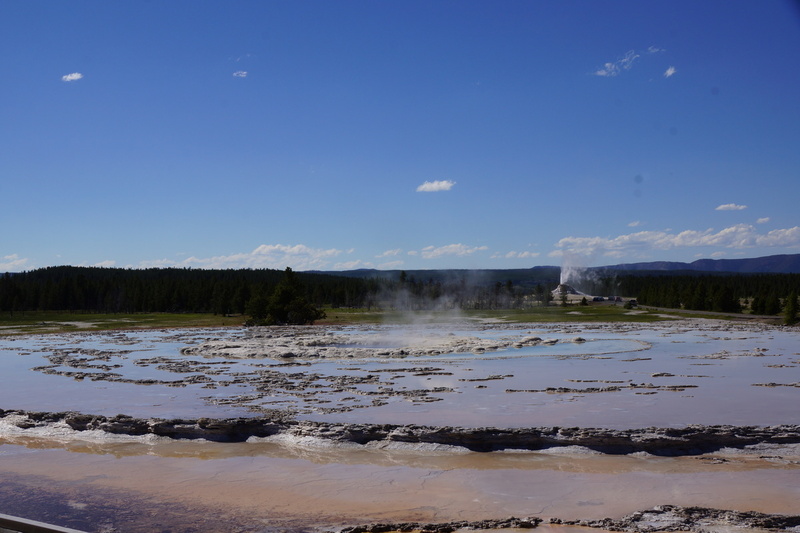 Monument Geyser Basin contains small geysers, fumeroles, and strange tubes of calcium that regularly emit clouds of steam. On this day, it also contained Random. One of the chimneys emitting steam. Eric and Random on the trail down. 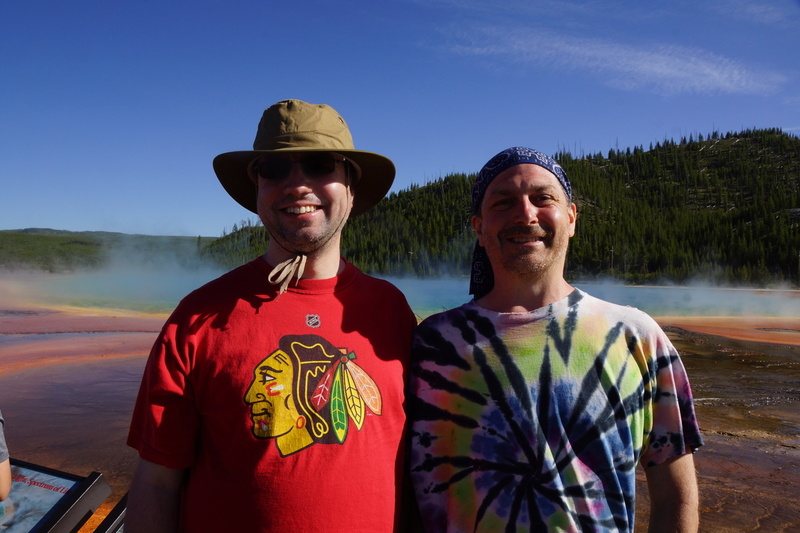 Our last stop of the day was the Great Fountain Geyser. 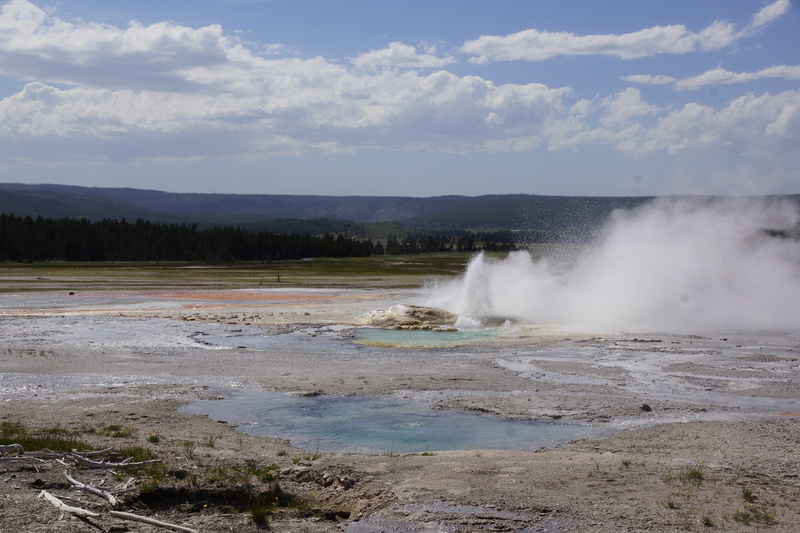 This geyser erupts only once or twice per day, but regularly shoots water 100 feet in the air. 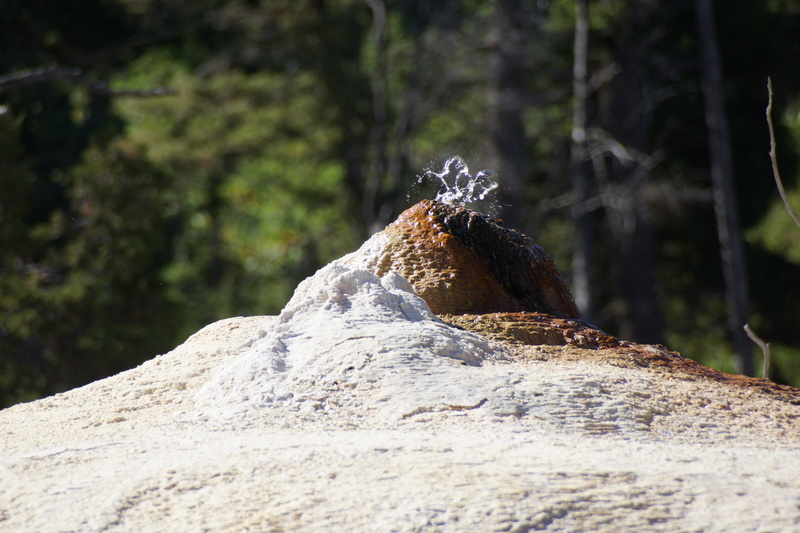 The White Dome geyser is erupting in the distance. Unfortunately, today, it was as placid as a cow pond. Random decided that there was nothing great about this geyser, and that it should be renamed Disappointing Steam Hole. We finally left as it was getting dark. For our last stop, we decided to hike to the petrified forest. The way is marked by occasional petrified stumps and logs. Random pauses by an enormous, downed petrified tree. 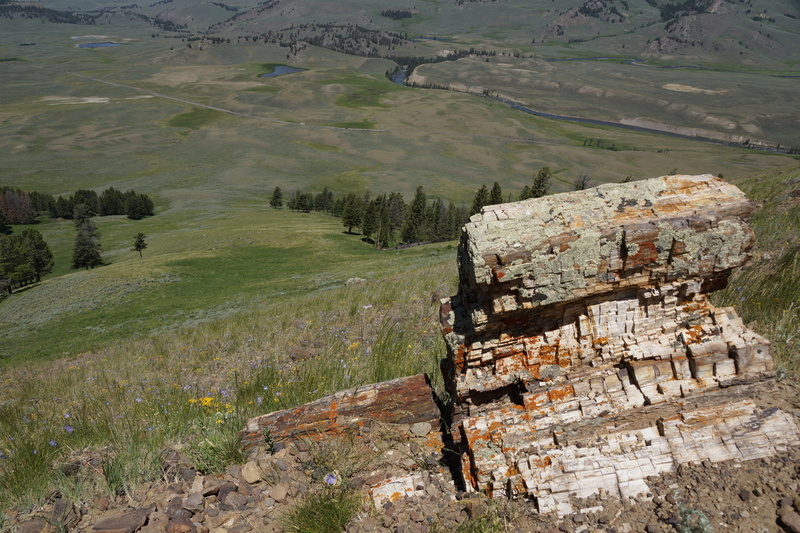 Another petrified log overlooks the valley. Random and Eric making soap commercials. The petrified forest is not at the summit of the hill. However, we were. 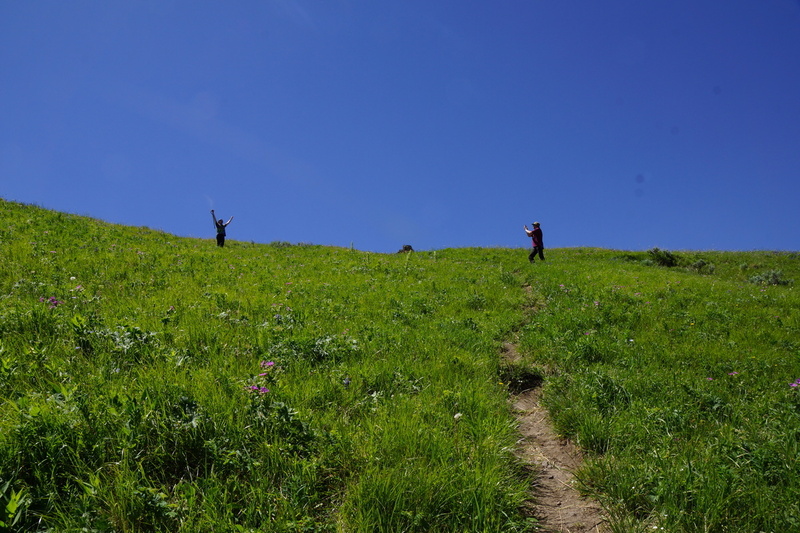 There are many trails criscrossing the mountain, and we ended up on the wrong one. We finally made it to what was (I think) the petrified forest. 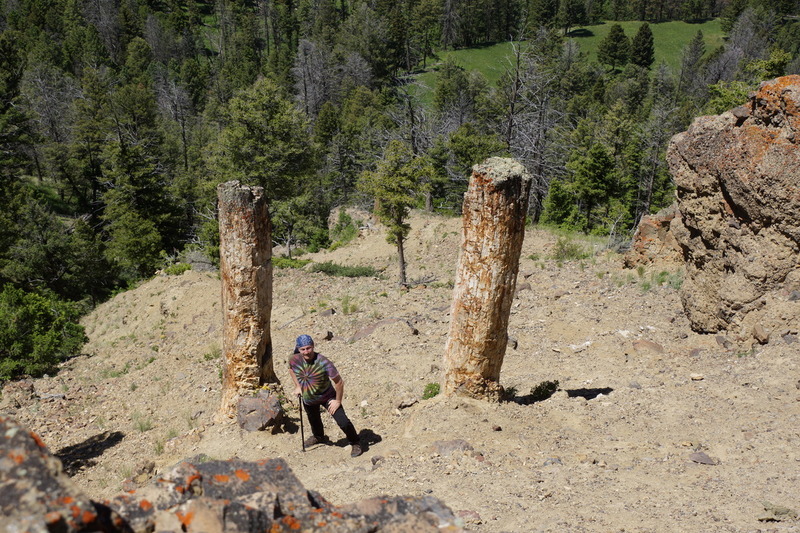 A huge petrified stump marked the place. Ace and Random pose for a tourist photo. Eric made it a bit further down, to a pair of standing trees. These three trees seemed to be the most forest-y part of the petrified forest trail. 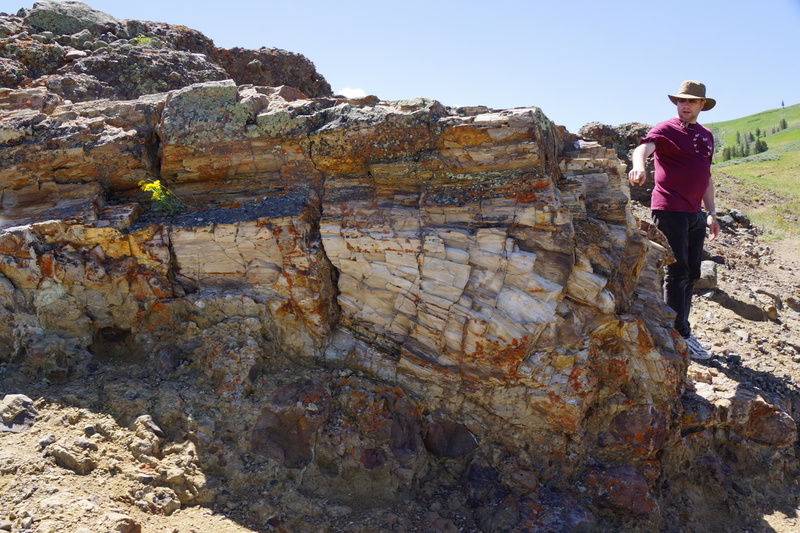 We later learned that the petrified forest is actually many layers of forest buried by successive eruptions. The soft rock crumbles over time, and falls down the hillside. Gradually, parts of the forest fall down the hill, and new parts are revealed. Thus on this occasion there may be only two trees and a stump, but in a few years there may be more, or fewer. 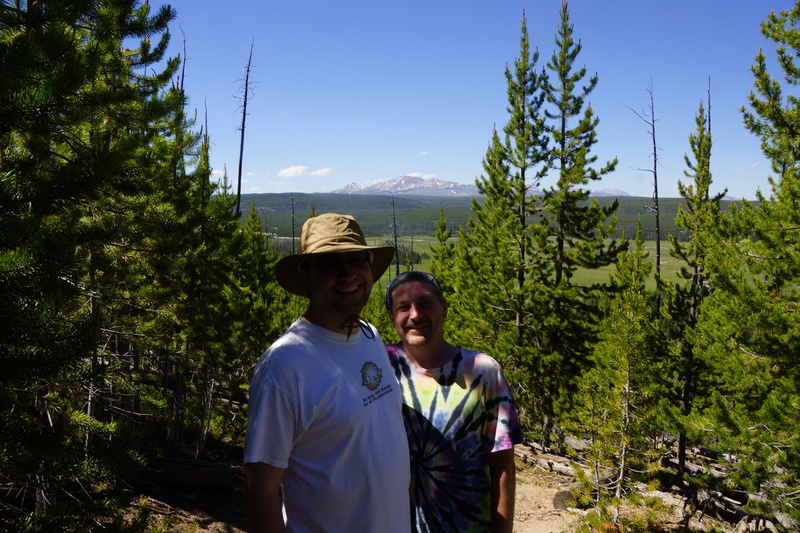 Eric and Random on the ridgetop overlooking the trail. 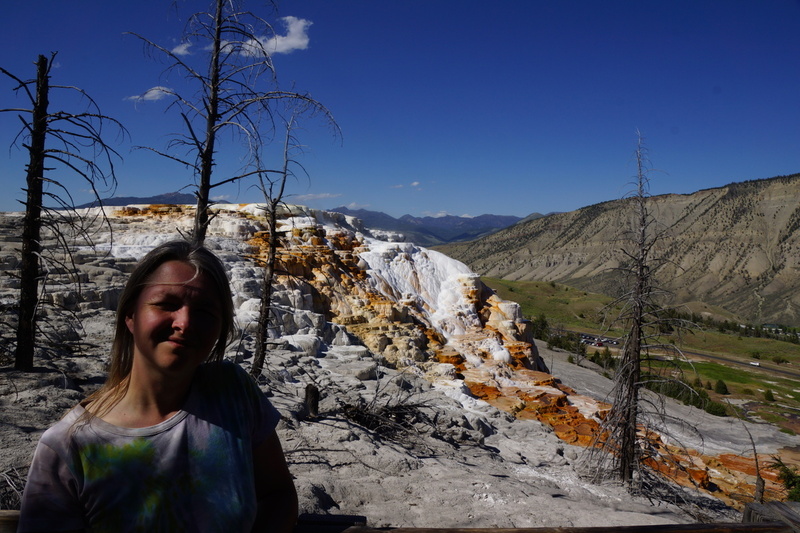 The last stop was Mammoth Hot Springs. 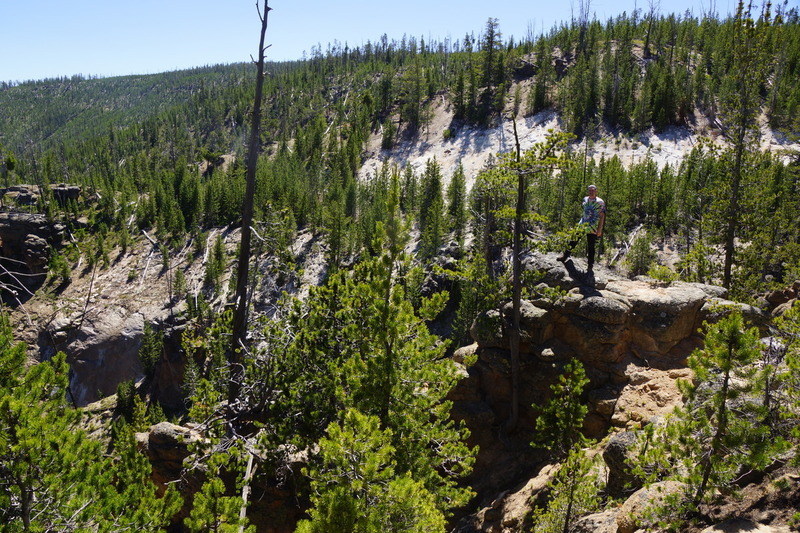 Like much of Yellowstone, the active areas shift over time. This area, looking like an inside-out cave, was formed by hot springs but no longer has any water. 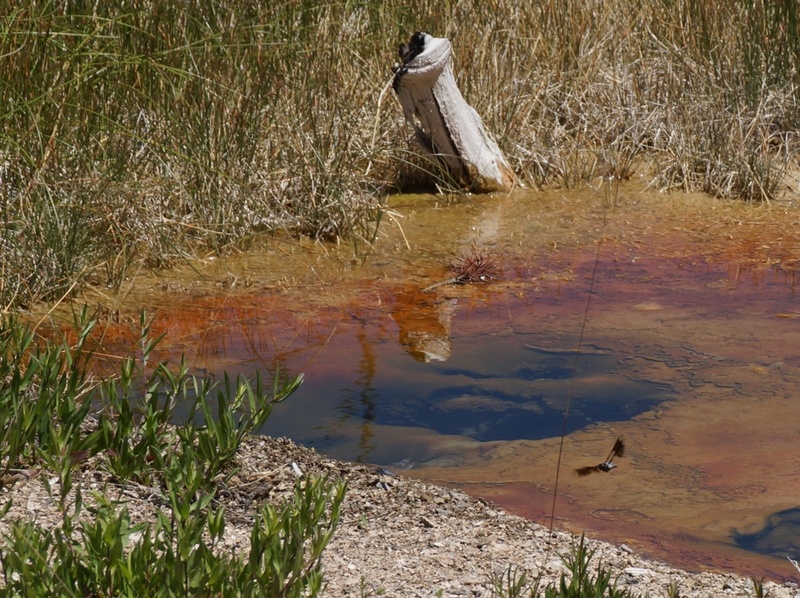 The areas that do have water are colored by the red bacterial mats. 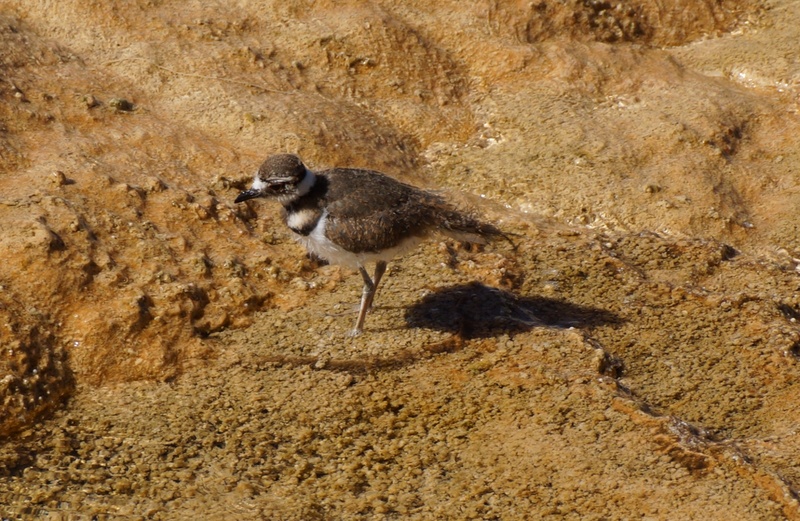 A sandpiper forages in the mats. 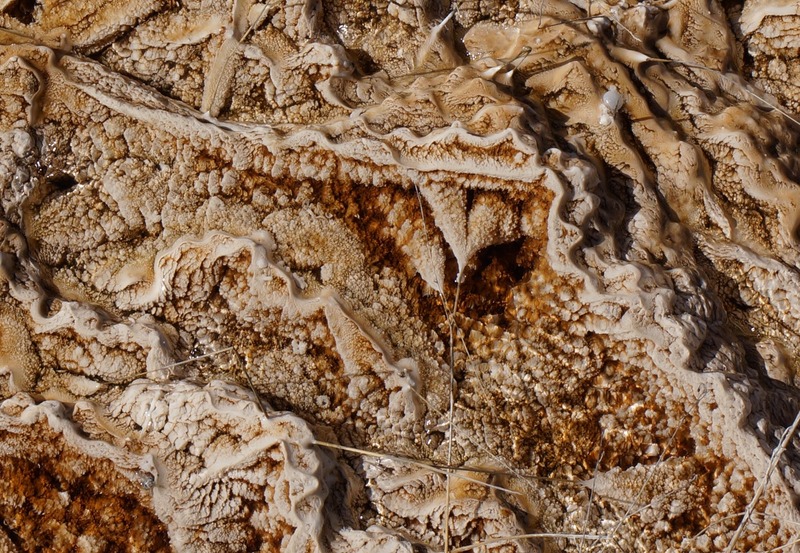 Grass along the edges of the pools dies, and is eventually calcified into a criscrossing pattern. 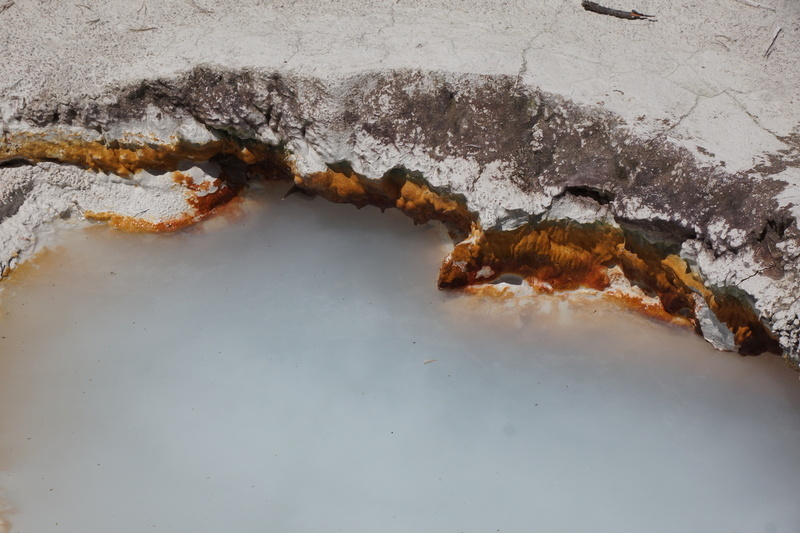 Probably, these small formations eventually determine the shape of the larger pools. An unnamed spring on the main terrace. 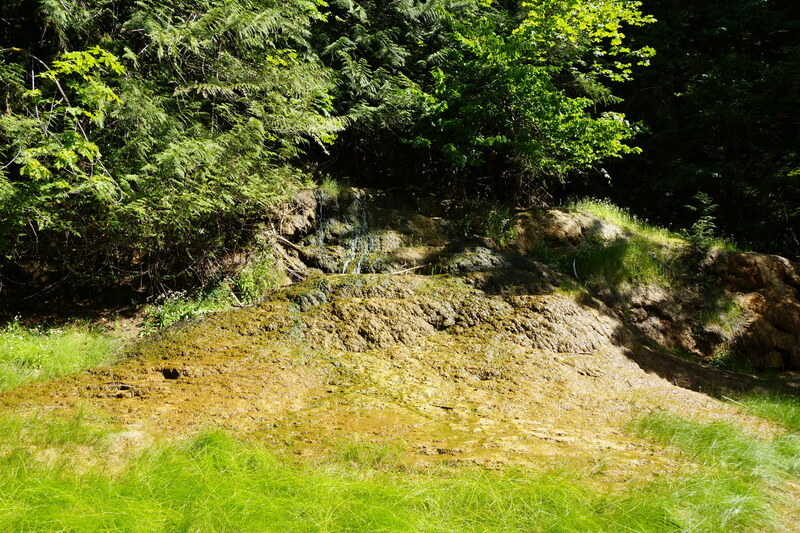 The spring at the top of the Orange Spring Mound. 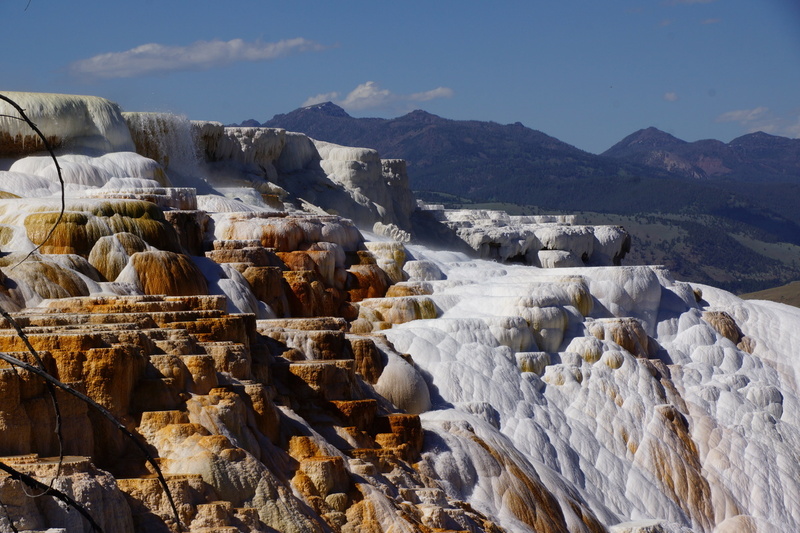 A last look at the strange world of Yellowstone before heading back to civilization. 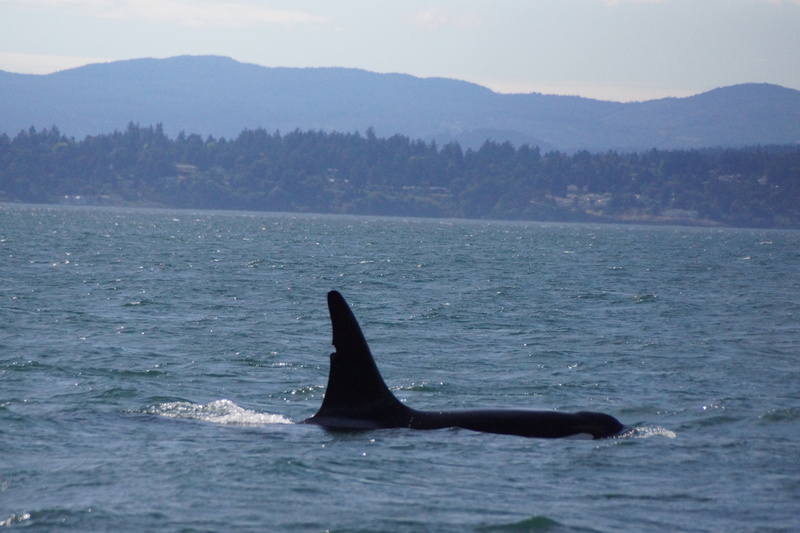 After visiting family in Saint Louis and Kansas City, we went on to go whale watching off of San Juan Island. San Juan is home to much more than just whales, of course. 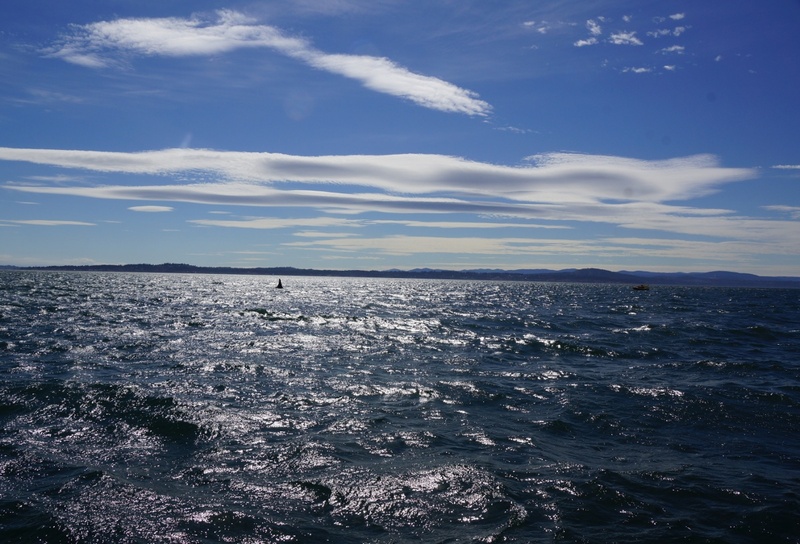 On the boat - first stop is an island of harbor seals. Note the mother and baby on the far left. 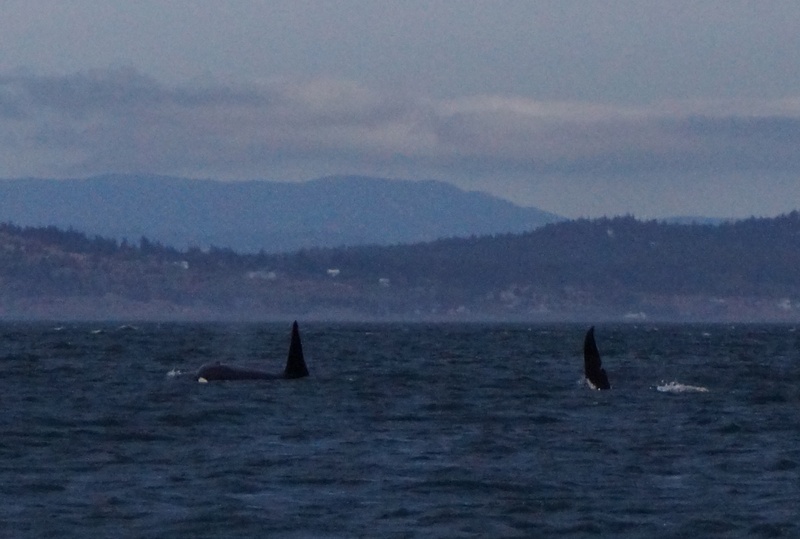 Today we found two male transient orcas - the mammal-eating variety that earned orcas the name killer whale , for their ability to kill other, larger whales. This is T125A and T128, two brothers who are often found together. 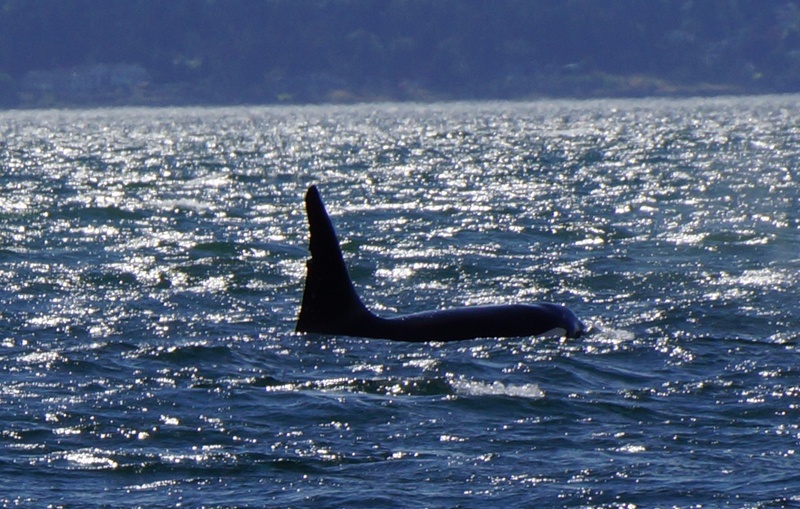 Unlike the resident orcas, which travel in a group with their extended family, transient orcas are rarely found in groups larger than three, and that is usually a mother with two offspring - her oldest male offspring and her newest calf. Other offspring will leave when a new calf is born. 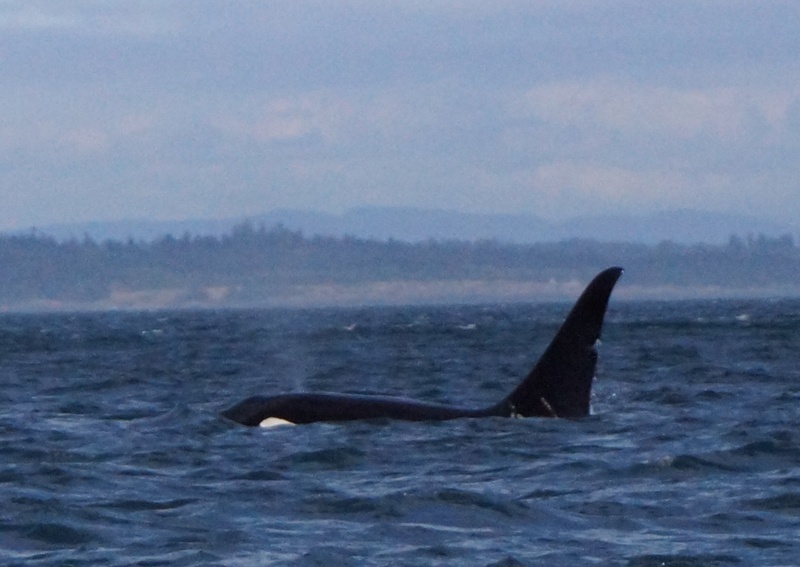 T125A has a very distinguishing notch in its dorsal fin. 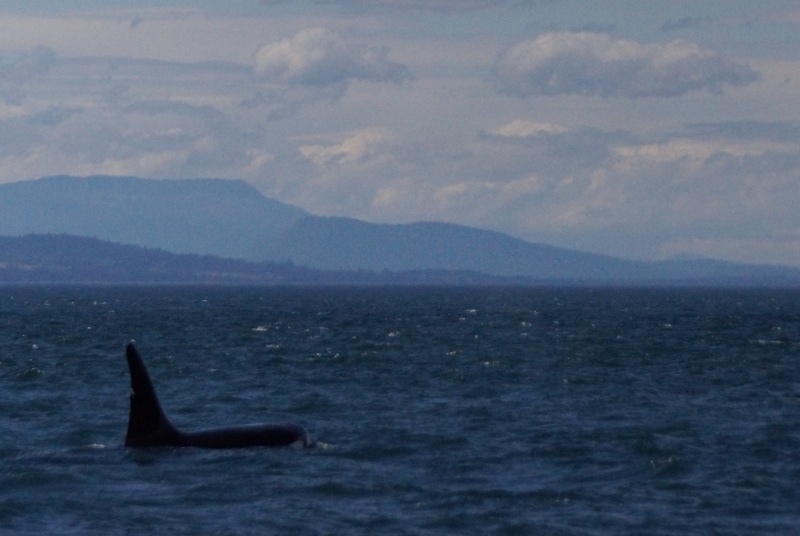 Today, though, these guys seemed entirely uninterested in hunting whales, or in fact doing anything but lazing about in the water. 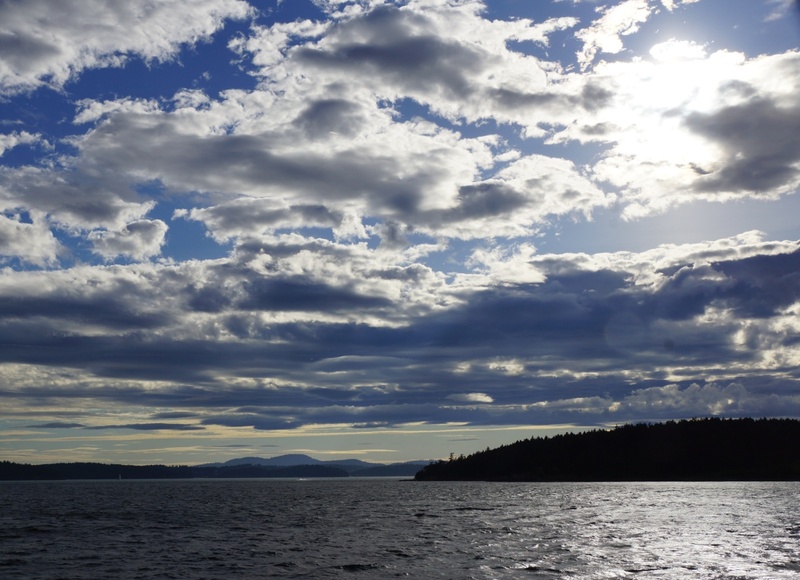 But despite the lack of action, it was a beautiful day on the water. T125A in the afternoon light. 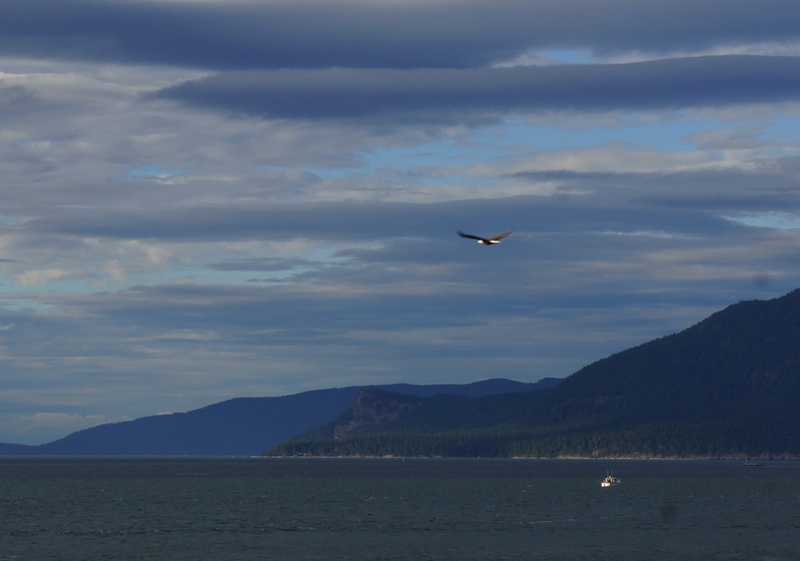 As a bonus, a bald eagle flew by while going home on the ferry. 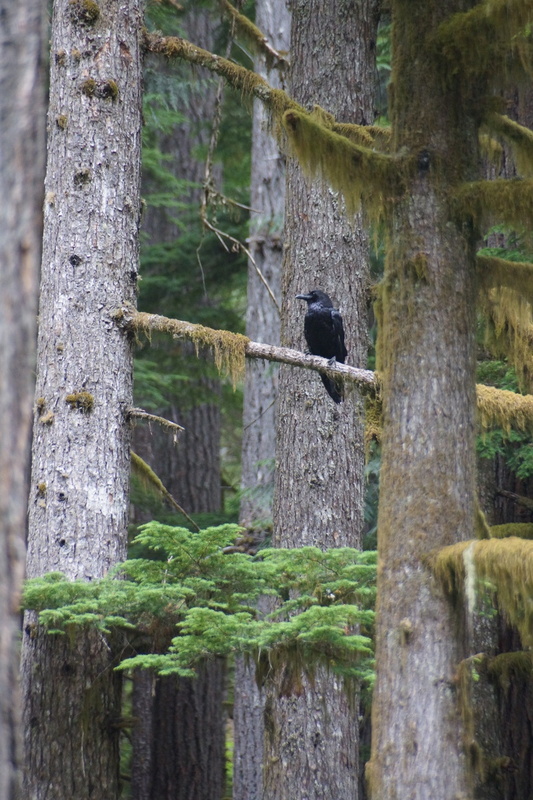 For the final stop, we went camping in the old growth forest on the east side of Ranier. 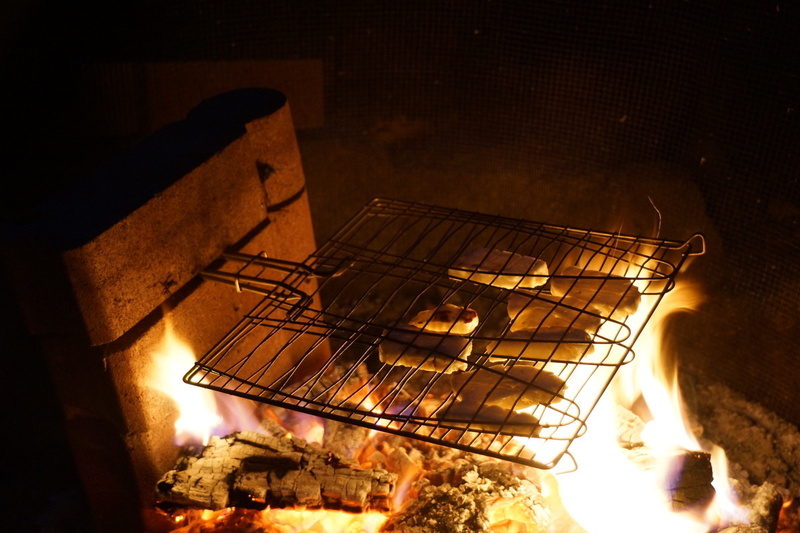 Cooking halloumi on the barbecue, American style. 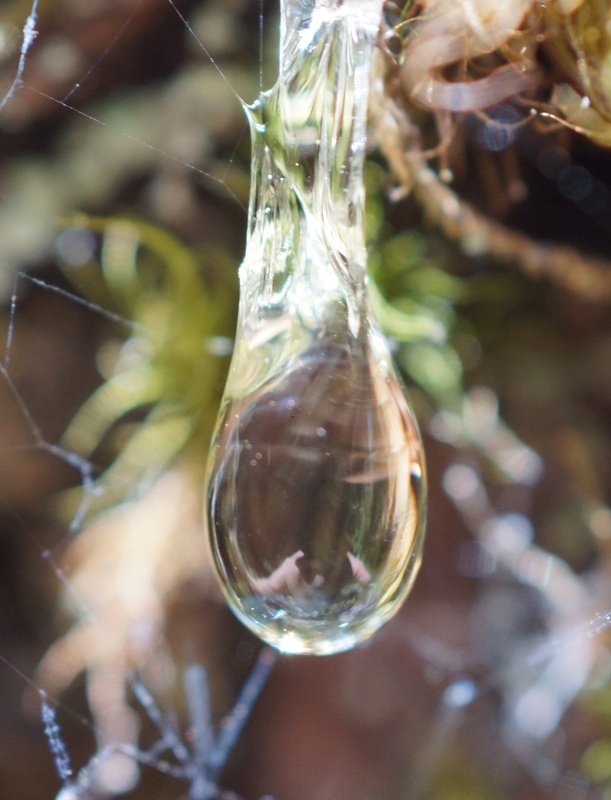 One of the trees at our campsite had been lightly burned, and was leaking sap in glittering droplets. 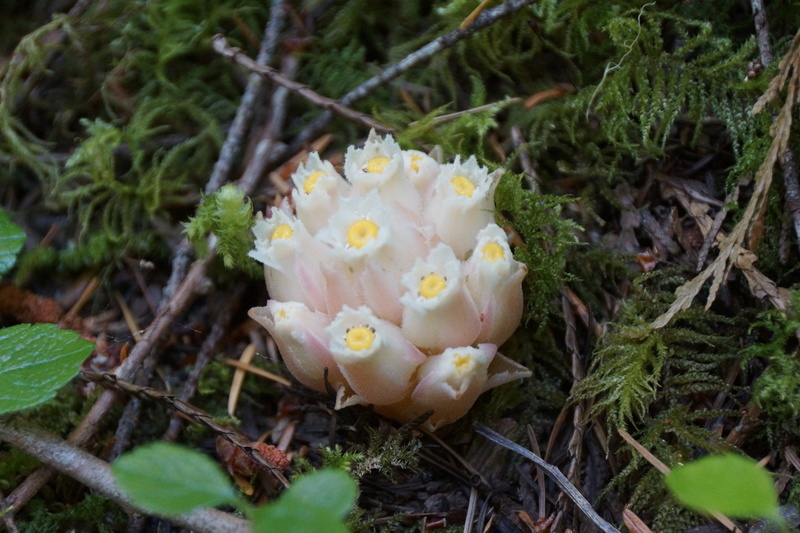 Indian Pipe, a plant that has no chlorphyll but instead parasitizes fungus for its nutrition. The (comparatively) tiny Ohana hot spring. Someone has made a wading pool from this part of the spring. Note the bubbles in the back of the pool. 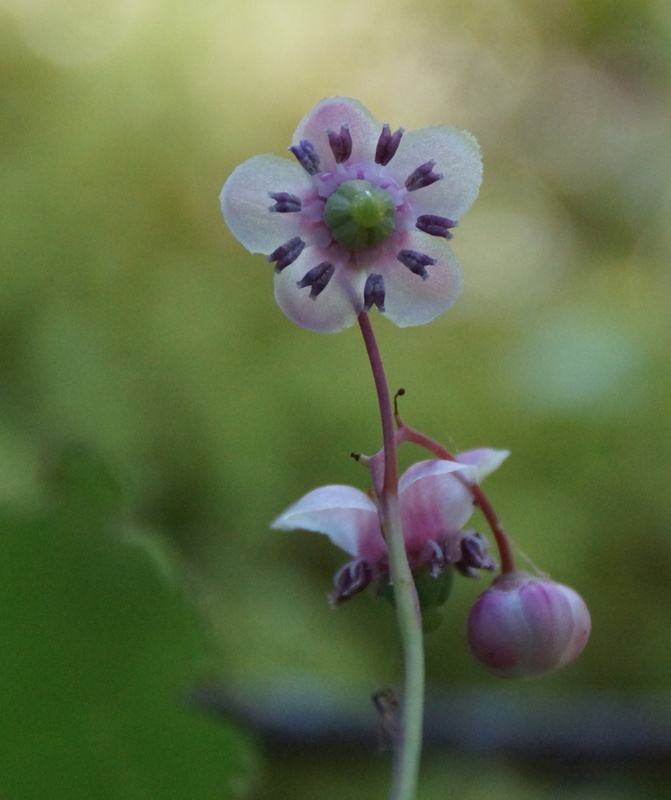 An as-yet-unidentified flower on the trail back from the hot spring. 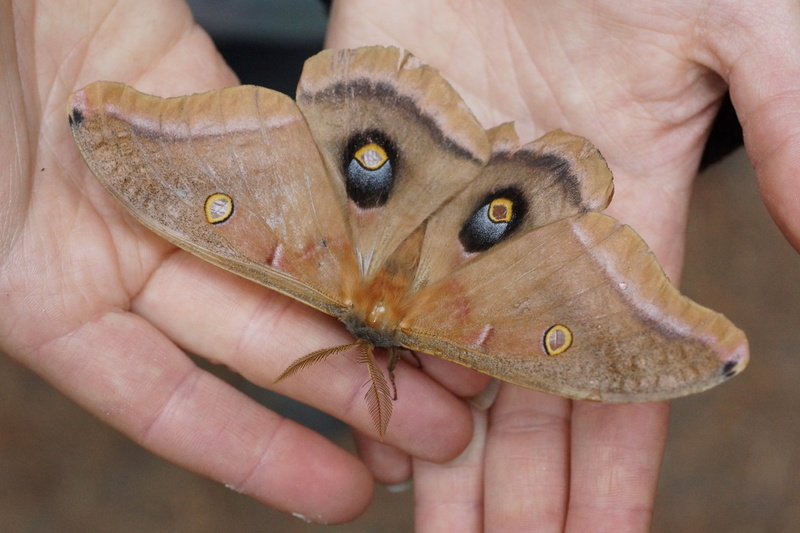 Antheraea polyphemus, or giant silk moth. 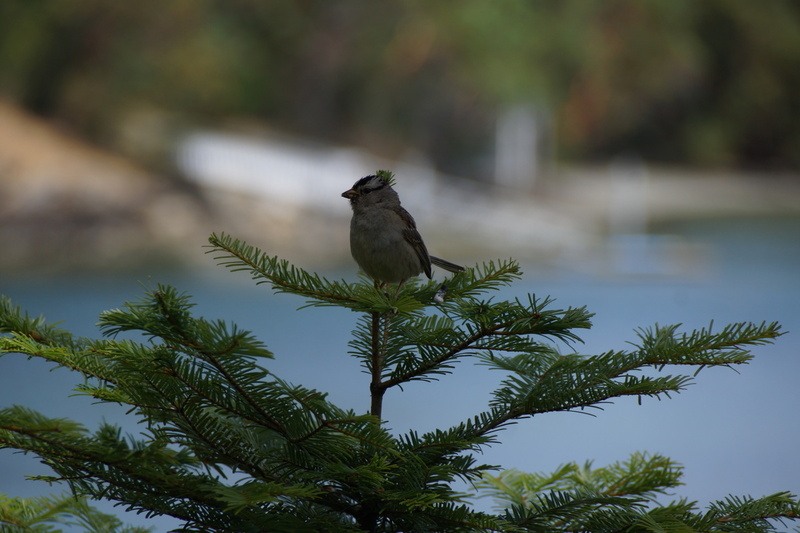 In this area they are probably living on the big leaf maples. This one was living on the floor of campsite washroom, so I picked it up to save it from being stepped on. 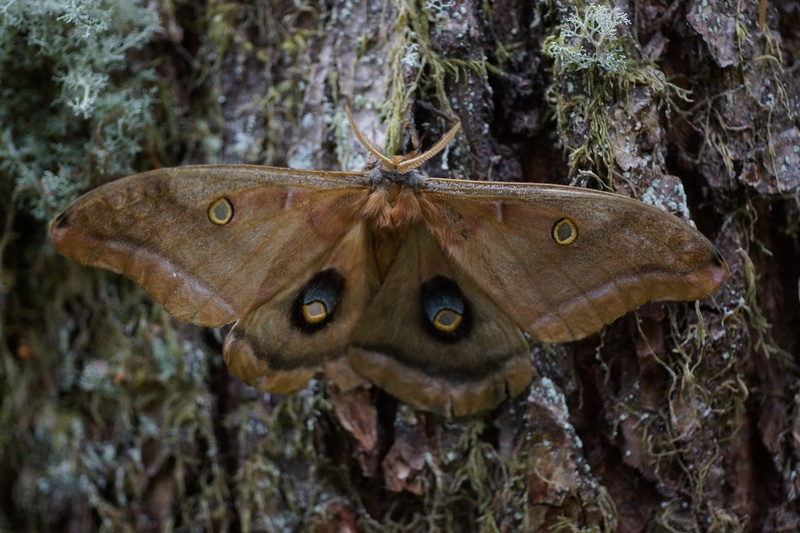 Given its relatively dull colors and tattered wings, it is probably old anyway. 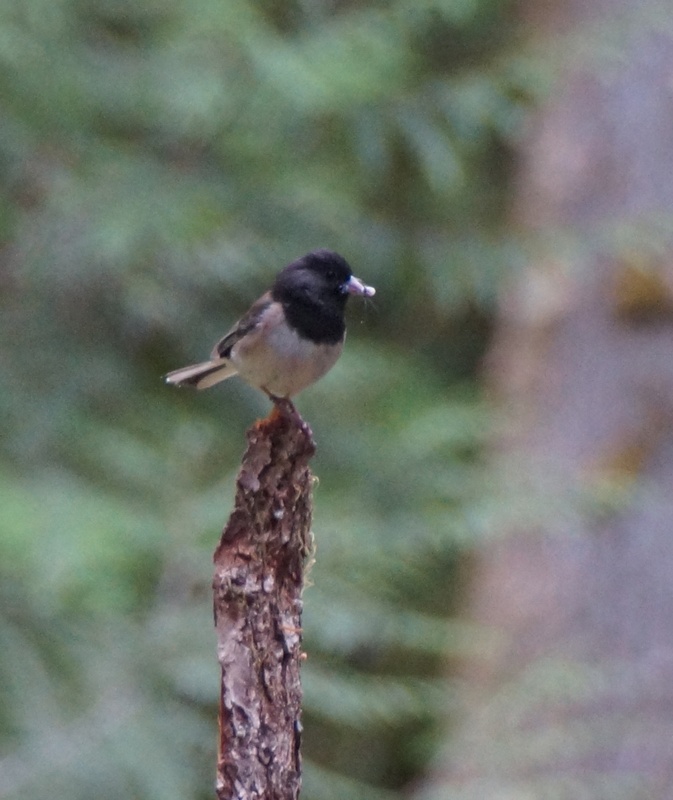 I set it on a nearby tree trunk. 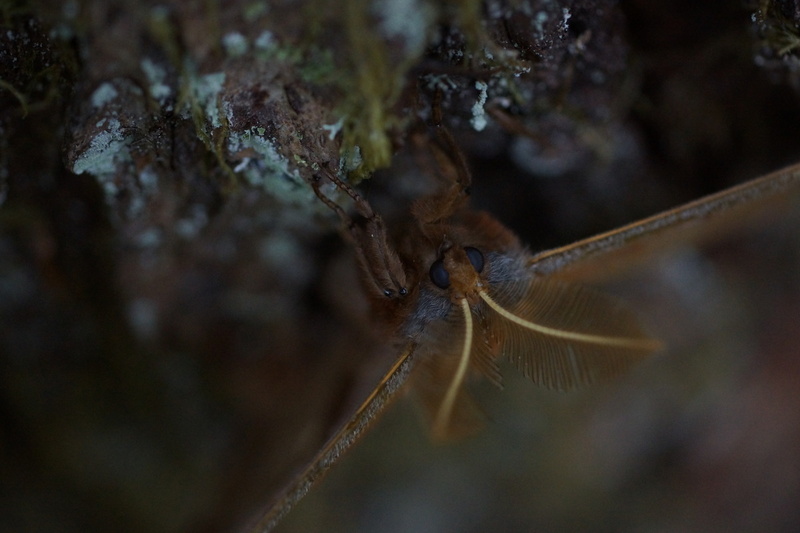 After spending a couple minutes vibrating its wings (warming up, perhaps?) it took off. The ravens discussed whether we would leave anything for them as we packed up camp. For those that are not arachnaphobic, there's also a new spider on the spiders page. Due to spam comments, links are not allowed. If you want to post a link, email your comment to me.